Recent advances in single-cell transcriptomics techniques have opened the door to the study of gene regulatory networks (GRNs) at the single-cell level. Here, we studied the GRNs controlling the emergence of hematopoietic stem and progenitor cells from mouse embryonic endothelium using a combination of single-cell transcriptome assays. We found that a heptad of transcription factors (Runx1, Gata2, Tal1, Fli1, Lyl1, Erg and Lmo2) is specifically co-expressed in an intermediate population expressing both endothelial and hematopoietic markers. Within the heptad, we identified two sets of factors of opposing functions: one (Erg/Fli1) promoting the endothelial cell fate, the other (Runx1/Gata2) promoting the hematopoietic fate. Surprisingly, our data suggest that even though Fli1 initially supports the endothelial cell fate, it acquires a pro-hematopoietic role when co-expressed with Runx1. This work demonstrates the power of single-cell RNA-sequencing for characterizing complex transcription factor dynamics. Over the past decade, advances in high-throughput transcriptomics and DNA occupancy analyses have provided valuable insights into how transcription factors (TFs) regulate cell fate decisions and determine cell identity. It has become clear that during embryonic development, the expression of key TFs is strictly regulated, and it has been shown that the combinatorial expression of a relatively limited number of TFs is sufficient to establish (and potentially change) cell identity and differentiation through their action on the underlying gene regulatory networks (GRNs) (Iwafuchi-Doi and Zaret, 2016). In this context, bulk transcriptomics analysis and chromatin immuno-precipitation sequencing (ChIP-seq) were used to describe TF interactions, thereby providing GRN models (Dunn et al., 2014; Mullen et al., 2011). Recently, these techniques were successfully used to study the embryonic hematopoietic system in an in vitro embryonic stem cell (ESC) differentiation model (Goode et al., 2016). However, the use of bulk cell populations constitutes an important limitation in our efforts to fully understand the GRNs. Although bulk transcriptomics can reveal crucial overall gene correlations between semi-stable cellular states, it cannot resolve subtler gene interactions occurring in complex transitional states. In addition, using a bulk approach makes it difficult to infer the direct consequences on the transcriptional landscape upon which these TFs are acting. These limitations can be overcome by the use of single-cell approaches. Over the past five years, tremendous technical progress has been achieved in the field. Gene expression can be efficiently assessed at the single-cell level, making it possible to distinguish subpopulations within tissues and cell cultures (Kolodziejczyk et al., 2015; Scialdone et al., 2016). Single-cell transcriptomics has previously been used to unravel complex developmental transitions such as gastrulation (Scialdone et al., 2016), demonstrating that it is possible to determine combinations of TFs that are expressed at the single-cell level as cellular differentiation progresses. In the present work, we applied single-cell transcriptomics approaches to the ontogeny of the blood system in the mouse embryo. The GRNs that are involved in the production of the hematopoietic stem and progenitor cells (HSPCs) at the origin of all blood cells are not well understood. During mouse embryogenesis, HSPCs are generated mainly in the yolk sac (YS), from E7–E7.5, and in the aorta-gonad-mesonephros (AGM) region, from E10.5. They emerge from the endothelial cells forming the vasculature, through a process called the endothelial to hematopoietic transition (EHT) (Boisset et al., 2010; Choi et al., 1998; Eilken et al., 2009; Lancrin et al., 2009; Zovein et al., 2008). It has been proposed that a heptad of seven TFs (Gata2, Runx1, Erg, Fli1, Lmo2, Lyl1 and Tal1) known to be essential for blood development form a transcriptional complex that is potentially involved in the generation of HSPCs. This proposal was based on bulk ChIP-seq analysis of the binding of these seven TFs to the regulatory elements of 927 genes in the HPC7 cell line (Wilson et al., 2010). Nonetheless, there was no direct evidence that all seven TFs were expressed together at the single-cell level during embryogenesis or that the heptad targets play a crucial role in development. Employing single-cell transcriptomics analysis and an in vitro ESC differentiation system that gives rise to blood cells, we addressed these questions and provided novel insights into the formation of HSPCs from endothelial cells. Our data show that during EHT, two sets of TFs have opposite effects that allow proper differentiation. Through the transition, Erg and Fli1 support the endothelial cell fate while Runx1 and Gata2 promote the hematopoietic one. Unexpectedly, we found that the endothelial transcription factor Fli1 could acquire a hematopoietic function when expressed together with the hematopoietic master regulator Runx1. This work shows that GRN analysis based on single-cell transcriptomics data can highlight biological aspects that are missed by classical bulk methods, emphasizing the power of single-cell approaches in the understanding of complex developmental transitions. We performed single-cell quantitative RT-PCR (sc-q-RT-PCR) on 95 genes associated with hematopoietic, endothelial (Endo), and vascular smooth muscle (VSM) cells (Supplementary file 1). Single cells were sorted from YS and AGM dissected from mouse embryos at E9, E10.5 and E11. To enrich for cells undergoing EHT, we selected cells using both the endothelial marker VE-cadherin (VE-Cad) and the hematopoietic marker CD41 (Figure 1—figure supplements 1 and 2). Using hierarchical clustering, these cells could be separated into three major groups in both tissues: Endo cells, Pre-HSPCs, which expressed both hematopoietic and endothelial genes (Taoudi et al., 2008), and HSPCs (Figure 1A and B, Figure 1—figure supplements 1 and 2). 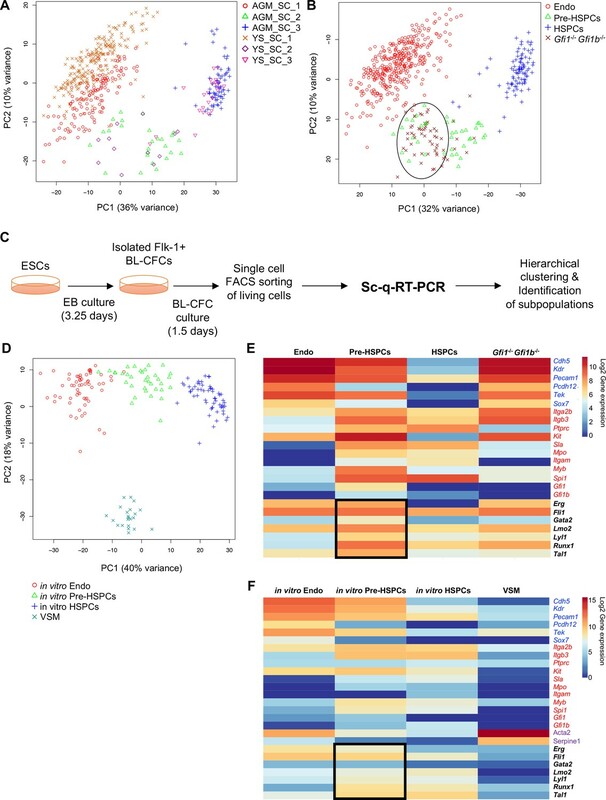 Analysis of in vivo and in vitro EHT by single-cell qRT-PCR identified the expression of key TFs at the Pre-HSPC stage. (A) Principal component analysis (PCA) plot showing the cells isolated at E9, E10.5 and E11 from AGM and YS according to the indicated sample clusters (SC). For each tissue, each time point represents one experiment. (B) PCA plot showing the Gfi1–/– Gfi1b–/– GFP+ YS cells mixing with Pre-HSPCs group (black ellipse). Note that the PC2 axis has been reversed. (C) Experimental workflow used to differentiate in vitro ESCs into blood cells. BL-CFC, blast colony forming cells; EB, embryoid body; FACS, fluorescence-activated cell sorting. (D) PCA plot showing the four groups of cells coming from in vitro differentiated ESCs. (E) Heatmap showing average expression of endothelial (blue), hematopoietic genes (red) and seven key TFs (black) in the four groups found in vivo. The black rectangle highlights the expression of the seven TFs. (F) Heatmap showing the average expression of endothelial (blue), hematopoietic (red), vascular smooth muscle genes (purple) and seven key TFs (black) in the four groups found after in vitro differentiation of ESCs. The black rectangle highlights the expression of the seven TFs. See also Figure 1—figure supplements 1–6, Supplementary file 1, 2, 3 and 11. While the frequency of each population of cells differed between tissues and time-points (Figure 1—figure supplement 3), groups were more strongly correlated (Pearson r > 0.9) to their counterparts than to other groups in the same tissue and clustered together using principal component analysis (PCA) and hierarchical clustering (Figure 1—figure supplement 4 and Figure 1A). In addition, E9.5 YS Gfi1–/–-Gfi1b–/–- cells, which are incapable of completing EHT due to the lack of the two transcriptional repressors Gfi1 and Gfi1b (Lancrin et al., 2012), clustered together with the Pre-HSPCs, reinforcing the notion that this population is an essential intermediary step between Endo and HSPCs (Figure 1—figure supplement 5 and Figure 1B). EHT can be recapitulated in vitro using the ESC differentiation model (Huber, 2010). We performed a 3.25 day differentiation followed by isolation of Flk1+ cells, enriched in blast colony forming cells (BL-CFCs) (Choi et al., 1998), which were cultured for a further 1.5 days before performing sc-q-RT-PCR using the same 95 genes (Figure 1C). Hierarchical clustering identified four groups, corresponding to Endo, HSPCs, and Pre-HSPCs found in the embryonic vasculature and a fourth group characterised by high expression of Acta2 (smooth muscle actin) and Serpine1 and by low expression of endothelial and hematopoietic genes, which we identified as VSM (Figure 1—figure supplement 6A and Figure 1D). In both the in vivo and in vitro systems, the most notable characteristic of the Pre-HSPCs population is the co-expression of seven genes coding for hematopoiesis-associated transcription factors: Erg, Fli1, Tal1, Lyl1, Lmo2, Runx1 and Gata2 (Figure 1E and F, Figure 1—figure supplement 6B and C), which have been proposed to work together as a complex (Wilson et al., 2010). By contrast, Endo cells expressed only Erg, Fli1, Lmo2 and Tal1 whereas HSPCs expressed Fli1, Lmo2, Lyl1, Runx1 and Tal1. This suggested that these seven TFs might be important in establishing and/or maintaining the cell-type identity of the Pre-HSPCs population. The co-expression of the seven TFs in the Pre-HSPCs populations in vivo and in vitro prompted us to ask whether the co-expression of these genes could be linked to the identity of the Pre-HSPCs. To determine the effect of the expression of these seven factors at the single-cell level, we established an inducible ES cell line in which all seven genes and Cbfb, a protein that is essential for Runx1 DNA binding and function (Wang et al., 1996; Tahirov et al., 2001), could be expressed simultaneously following the addition of doxycycline (dox). We generated an inducible ES cell line (i8TFs) in which the eight coding sequences were linked together by T2A sequences (Figure 2A). This strategy exploits the ‘ribosomal skipping’ mechanism of the viral T2A peptide (Donnelly et al., 2001) to allow the production of eight proteins from a single transcript. The expression of all eight proteins was validated by western blot after 24 hr of dox treatment in ESC culture (Figure 2B). As a control, we created an ESC line, which does not contain any novel cDNA (Empty), but is otherwise identical to the i8TFs line. Generation of a doxycycline-inducible ESC line for the simultaneous expression of the eight transcription factors. (A) Scheme showing the generation of the i8TFs ESC line. (B) Western blot showing the protein expression of the eight TFs after doxycycline (dox) treatment in the Empty line and in the i8TFs ESC line. See also Supplementary file 11. We studied the effect of the overexpression of the eight TFs during hemangioblast differentiation. After three days of EB culture, the Flk1+ cells were differentiated for one day in BL-CFC culture, at which time the cells have lost their mesoderm identity and have produced endothelial and vascular smooth muscle cells. Dox was added at this time point, and cells were cultured for two more days. Cells were imaged every 15 min for 48 hr and were harvested at the end of the culture for flow cytometry. The Empty cell line did not show any major difference, neither in terms of cell surface markers nor in terms of cell morphology after dox treatment. By contrast, we noticed a dramatic change following the activation of the eight TFs when almost all cells developed the same phenotype (VE-Cad+ CD41+ and cKit+ CD41+ depending on the staining) (Figure 3A). This change was accompanied by a marked decrease in the number of round cells (Figure 3B and Figure 3—figure supplement 1). The simultaneous expression of the eight TFs did not change the frequency of living cells (Figure 3C) but there was a 40% decrease in the number of cells in S phase, suggesting that the expression of the eight TFs has a negative impact on cell proliferation (Figure 3D). 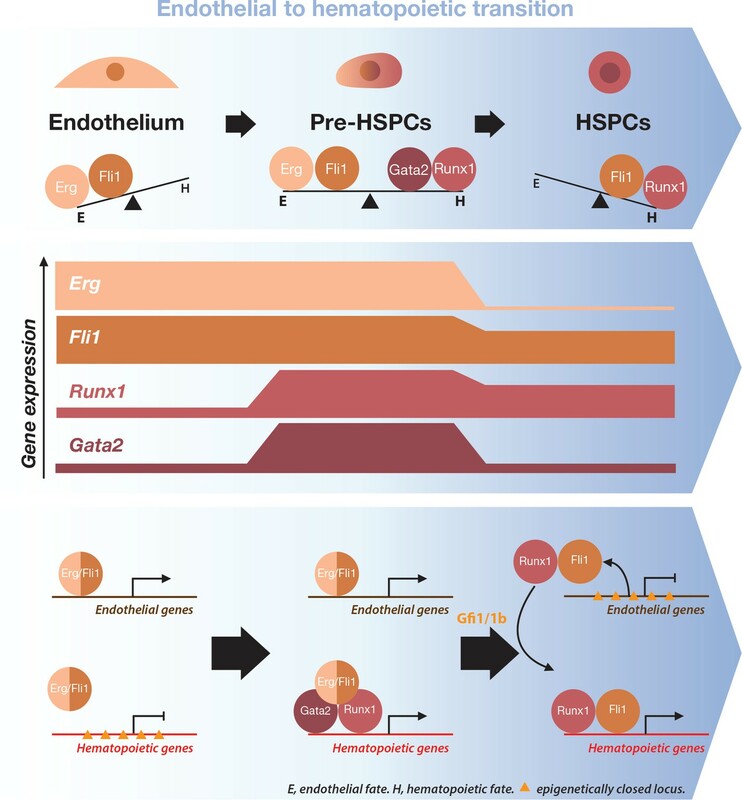 Hematopoietic differentiation of the i8TFs ESC line highlights the role of the eight transcription factors in the generation of Pre-HSPCs. (A) Representative FACS plots of VE-Cad, cKit and CD41 expression after 3 days of BL-CFC culture of the indicated ESC lines (n = 3). (B) Graphs showing the average numbers of round cells counted per frame (n = 3) in a 48 hr time course for the indicated ESC lines. Error bars represent standard deviations. (C) Bar graph indicating the frequency of non-apoptotic living cells for the indicated ESC lines. Error bars represent standard deviations (n = 3). (D) Bar graph displaying the frequency of cycling cells for the indicated ESC lines. Error bars represent standard deviations (n = 3). (E) Bar graph displaying the number of hematopoietic colonies after replating cells in a colony-forming-unit assay from the indicated conditions. Error bars represent standard deviation (n = 4). ns, non significant. ** p-value<0.01 (paired two-tailed t-test). * p-value<0.05 (paired two-tailed t-test). See also Figure 3—figure supplement 1 to 5, Supplementary file 1, 4, 5 and 11. To evaluate the impact of the simultaneous overexpression of these eight genes on hematopoietic differentiation activity, we performed a colony-forming unit (CFU) assay. We plated the cells from both the i8TFs – dox and the i8TFs + dox conditions in the absence of dox in a medium that allows the growth of both myeloid and erythroid cells. We observed a dramatic increase in the number of colony-forming units from the +dox cells, suggesting that the induction of the eight TFs increases hematopoietic differentiation potential (Figure 3E). The overexpression of the eight TFs led to the production of a majority of VE-Cad+ CD41+ cells (Figure 3A). However, at the beginning of dox treatment, the majority of cells were VE-Cad– CD41– (Figure 3—figure supplement 2A), which were enriched in vascular smooth muscle cells (named eVSMs) (Figure 3—figure supplement 2B). To understand the impact of the expression of the eight TFs on the two main non-hematopoietic populations — the VE-Cad+ CD41- endothelial population (named Endo) and the eVSM — we isolated Endo and eVSM cells at day 1 of BL-CFC culture (Figure 3—figure supplement 2A) and cultured them in hemogenic endothelial (HE) culture conditions with or without dox for 48 hr. Using flow cytometry, we showed that both populations were affected by the dox treatment and became almost entirely VE-Cad+ CD41+ (Figure 3—figure supplement 2C). Furthermore, the CFU-assay showed an increased hematopoietic differentiation capacity for the Endo +dox compared to the –dox condition, confirming their successful conversion (Figure 3—figure supplement 2D). By contrast, the eVSM cells did not show a comparable effect, and together with the flow cytometry data, this evidence suggests that even though the eVSMs gained the Pre-HSPCs phenotype, they probably remained more immature than the Endo +dox cells (Figure 3—figure supplement 2D). To further characterize the effect of the eight TFs on the eVSM and Endo populations, we carried out a microarray analysis on i8TFs eVSM and Endo conditions before (t0) and 24 hr after differentiation with or without dox treatment (+dox and –dox) (Supplementary file 5). The Empty ESC line eVSM was used as control. As expected, the dox treatment of these cells had little effect on the transcriptome as shown by PCA (Figure 3—figure supplement 3A). By contrast, the expression of the eight TFs changed the Endo and eVSM cells dramatically. Interestingly, the eVSM +dox group clustered closely to the Endo -dox and Endo +dox conditions but far apart from the eVSM -dox group. Differentially expressed gene (DEG) analysis highlighted the genes responsible for these changes (Figure 3—figure supplement 3B and Supplementary file 5). Gene ontology (GO) analysis of the DEGs showed that overexpression of the eight TFs led to the reduced expression of genes involved in vasculature and heart development, while there was an increase in the expression of genes linked to immune system and vasculature development for eVSM (compatible with the dual endothelial-hematopoietic identity of Pre-HSPCs) and cellular detoxification as well as vesicles for Endo (Figure 3—figure supplement 4A). Surprisingly, when comparing these DEGs with the 927 targets of the heptad identified by ChIP-seq, the overlap was only 26 genes (Figure 3—figure supplement 4B and C). This would suggest that the DEGs that we observed were not a direct consequence of the complex of eight TFs binding at the regulatory elements of these genes. 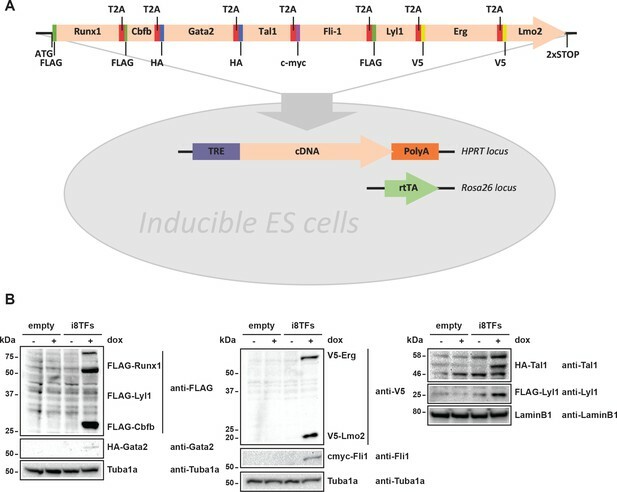 To find out whether the striking effect of the eight TFs is really due to the expression of several of these genes and not to the effect of one particular transcription factor, we generated eight inducible ESC lines for each of the single transcription factors (i1TF) (Figure 3—figure supplement 5A). Inducible expression of each TF was confirmed using western blot (Figure 3—figure supplement 5B). Using the same experimental layout as that used previously for i8TFs and Empty ESC lines, we performed BL-CFC assays and FACS analyses with these eight new ESC lines and studied the effect of dox treatment on each of them. We found that none of the i1TF lines were qualitatively similar to the i8TFs (Figure 3—figure supplement 5C and D). To better distinguish differentiated cell populations, we repeated the BL-CFC culture with –dox/+dox treatment for the ten cell lines followed by sc-q-RT-PCR of the 95 genes used previously (Figure 4 and Supplementary file 6). In total, 854 cells were processed using sc-q-RT-PCR and passed quality control. Six biologically relevant cell clusters could be identified using hierarchical clustering analysis, and they were assigned names based on the expression of specific marker genes (Figure 4A). The Endo, VSM and Pre-HSPCs groups were defined as before (Figure 1). On the other hand, HSPCs were split into three groups: Erythroid Progenitor Cells I and II (EryPCs_I and EryPCs_II, respectively) and Myeloid Progenitor Cells (MyePCs). EryPCs_I and EryPCs_II were characterized by the expression of erythroid genes such as Gata1 and Hbb-bh1. EryPCs_I appeared to be more immature than EryPCs_II because the cells still express a high level of Itgb3 and Pecam1. MyePCs were characterized by the expression of myeloid markers such as Sfpi1 (or Pu.1) and Itgam and by the lack of erythroid genes. Single-cell transcriptomics analysis of i8TFs and i1TF ESC lines. (A) Hierarchical clustering showing the sc-q-RT-PCR results for 95 genes on the ten inducible ESC lines after three days of BL-CFC culture. The clusters were defined according to the intersection of the red dotted line with the dendrogram in the upper part of the heatmap. (B) Bar graphs displaying the cell number in each of the six clusters defined in (A) for the ten cell lines. Stars indicate significant differences for +dox conditions (see Supplementary file 6 for p-values). See also Figure 4—figure supplements 1 and 2, Supplementary file 1, 6 and 11. For each cluster, the number of cells per condition was calculated and each +dox condition was statistically compared to all –dox conditions (Figure 4B and Figure 4—figure supplement 1). This analysis confirmed that following dox addition, the i8TFs cells form a Pre-HSPCs population co-expressing endothelial and hematopoietic genes, as suggested by the flow cytometry results. By contrast, none of the other cell lines presented such a dramatic change. Induction of Gata2 increased the frequency of EryPCs_II population by ~4 fold (Figure 4B). On the other hand, overexpression of Erg and Fli1 gave rise to slightly more Pre-HSPCs (Figure 4B). The other i1TF ESC lines had negligible changes upon dox treatment (Figure 4B and Figure 4—figure supplement 1). Our sc-q-RT-PCR results suggested that the cells were homogeneous after the induction of the eight TFs. To confirm this observation, we carried out single-cell RNA sequencing (sc-RNA-seq) on i8TFs –dox, i8TFs +dox, Empty –dox and Empty +dox cells using the iCELL8 platform (Figure 4—figure supplement 2A). Again, PCA showed that i8TFs + dox cells were clearly clustered separately from the other cells (Figure 4—figure supplement 2B). On the basis of the PC2 variance, we noticed that there is less variance for the i8TFs +dox cells compared to the other three conditions. Altogether, this would suggest that the i8TFs +dox cells are comparatively more homogeneous than the control cells. To better characterize the i8TFs +dox cells compared to embryonic populations, we examined the expression pattern of CD41, CD43 and CD45 proteins together with VE-cad. It has been shown that these markers could define more precisely several intermediate stages in the EHT process: Pro-HSCs (VE-Cad+ CD41+ CD43– CD45–), Pre-HSCs type I (VE-Cad+ CD41+ CD43+ CD45-) and Pre-HSCs type II (VE-Cad+ CD41+ CD43+ CD45+) (Rybtsov et al., 2014). Our results show that around 99% of VE-cad+ cells in the i8TFs +dox condition have a phenotype similar to Pro-HSCs (Figure 5A and B). To verify this finding, we isolated from E10 AGM the Pro-HSCs and Pre-HSCs type I populations and performed sc-q-RT-PCR with our set of 95 genes (Figure 5—figure supplement 1A and B). Interestingly, we found that the Pro-HSCs population was heterogeneous. Although all cells express a high level of endothelial genes, only half express blood genes such as Runx1, Gfi1, Sfpi1 and Myb. By contrast, the Pre-HSCs type I is more homogenous. All cells express endothelial genes but at a lower level compared to Pro-HSCs. Moreover, all cells express hematopoietic genes (Figure 5—figure supplement 1B). 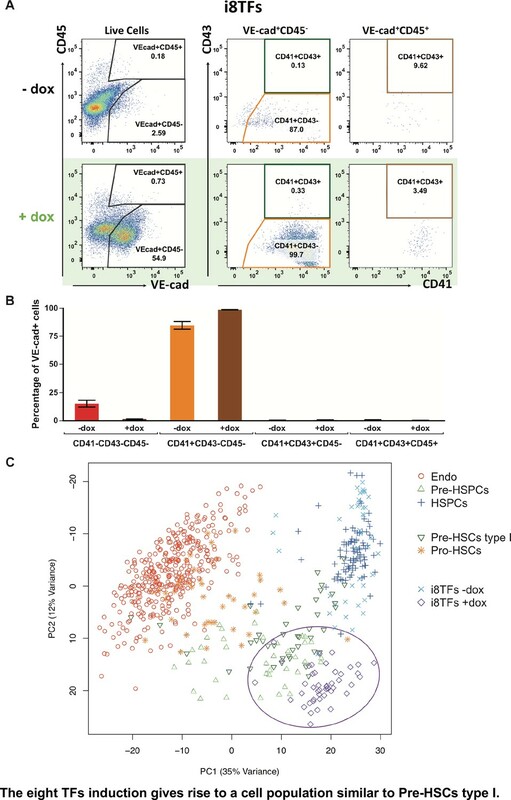 When we analyzed these cells together with the in vivo data from Figure 1A and the cells from i8TFs –dox and +dox cultures, we noticed that about half of Pro-HSCs clustered with Endo, while the other part clustered with the Pre-HSPC (Figure 5C). On the other hand, the Pre-HSCs type I clustered with Pre-HSPCs. Surprisingly, in opposition to their Pro-HSCs phenotype, we found that the i8TFs +dox were very close to the Pre-HSCs type I (Figure 5C). 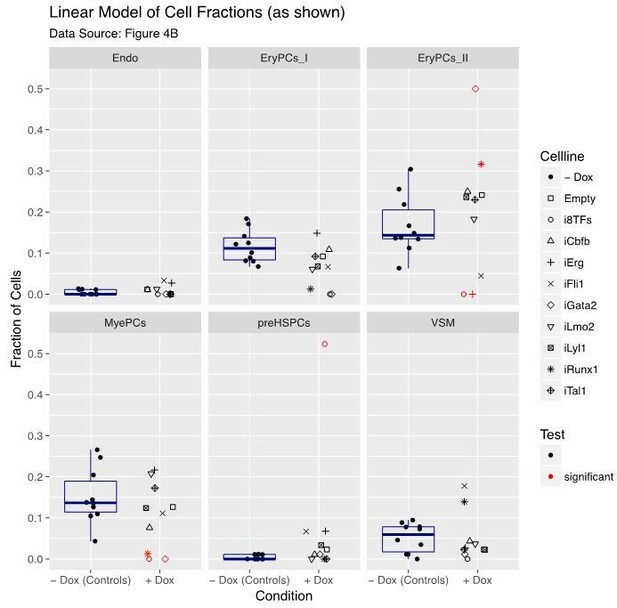 This was confirmed when the analysis was done without the seven TFs (Figure 5—figure supplement 1C) and when the single-cell qRT-PCR data from the 1,660 cells from Figures 1, 4 and 5 were combined (Figure 5—figure supplement 2). The eight TFs induction gives rise to a cell population similar to Pre-HSCs type I. (A) Representative FACS plots of VE-Cad, CD45, CD43 and CD41 expression after 3 days of BL-CFC culture of the i8TFs ESC line in the presence or absence of dox (n = 3). (B) Bar graphs showing the average percentage of the four different VE-Cad+ cell populations after three days of culture (n = 3). Error bars represent standard deviations. (C) PCA plot showing the sc-q-RT-PCR results for 95 genes combining the cells from the i8TFs cell line after three days BL-CFC culture with the results from cells collected from wildtype YS and AGM regions (Figure 1B) and from the E10 AGM Pro-HSCs and Pre-HSCs type I. Note that the PC2 axis has been reversed. The ellipse highlights i8TFs +dox. See also Figure 5—figure supplements 1 and 2, Supplementary file 1, 7, 8 and 11. In conclusion, although the i8TFs +dox cells had a phenotype similar to that of the Pro-HSCs, their transcriptional profile was more similar to Pre-HSCs type I. To determine how the induction of the 8TFs by dox treatment affected GRNs using single-cell-RNA-seq, we decided to focus on the VSM cells because, unlike the Endo population, they are not naturally undergoing EHT (Figure 3—figure supplement 2C). Indeed, between Endo +dox and Endo –dox, there was only a two-fold increase in VE-Cad+ CD41+ population. On the other hand, there was a tenfold increase in VE-Cad+ CD41+ population between eVSM +dox and eVSM –dox (Figure 3—figure supplement 2C). Moreover, this population shows the largest gene expression contrast in our microarray data upon dox treatment, facilitating the identification of the GRNs controlled by the eight TFs (Figure 3—figure supplement 3B). As in the microarray experiments, VE-Cad– CD41– cells were sorted at day 1 of BL-CFC culture and cultured in the absence or presence of dox for 24 hr. Subsequently, cells from the –dox and +dox conditions were pooled at a 1:1 ratio and put on a Fluidigm C1 chip. The Fluidigm system allowed a higher sensitivity than the Wafergen system, but it did not allow the processing of several conditions and a large number of cells at the same time. The experimental design whereby cells were mixed and loaded onto one chip minimized the technical variability that would invariably arise from using two separate chips (Figure 6—figure supplement 1A). We obtained two biological replicates, and from each chip 96 cells (192 cells in total) were isolated and sequenced together. To determine which cells were exposed to dox we used the expression of the transgene (Figure 6—figure supplement 1B). A PCA of the sequencing data showed that cells expressing high levels of the 8TFs transcripts clustered separately from those expressing low levels of these transcripts (Figure 6—figure supplement 1C). To identify regulatory relationships for the eight TFs, we performed a network analysis using the generalized distance correlation measure, dcor statistic (Székely et al., 2007), together with its conditional version pdcor (Székely and Rizzo, 2014). This measure has the advantage of being able to detect both linear and non-linear relationships between the transcriptome and the seed genes. However, when only the eight TFs were used as seeds, the resulting network was very small with only five of the eight TFs represented (not shown). Thus, we expanded the set of seed genes to include Gata1, Gfi1b, Spi1 (or Pu.1), Ldb1 and Cbfa2t3, which are known to play important roles in hematopoiesis. Using this extended set of genes, we obtained a network that illustrated how the eight TFs indirectly interacted through a common regulatory pathway (Ferreira et al., 2005; Goardon et al., 2006; Imperato et al., 2015; Lancrin et al., 2012; Mylona et al., 2013). The directionality of the relationships, positive correlation or negative correlation, was defined using the sign of a two-tailed t-test (gene-pairs with p>0.05 were assigned to ‘other’). Finally, interactions between seed genes were identified by conditioning the ‘targets’ of each seed gene on the expression of each other seed gene. An interaction was inferred if the relationships between both seed genes and a particular ‘target’ gene increased in strength when conditioning on the other seed gene. When visualizing the resulting network, we only plotted the seeds that interacted with at least with one other seed (black lines) and the gene targets of at least two seed interactions (Figure 6A). Consistent with evidence from the literature, our network reconstruction method reports a tight interaction between the seed factors, apart from Lbd1, they are all included in the resulting network. Furthermore, we observe a core network composed of Erg, Lyl1, Lmo2, Tal1, Gfi1b, and Gata1 with Fli1 and Runx1 on opposite ends of the periphery. Several of the genes that were identified as targets of the seed genes were also known from the literature; for example, Gpr56, which was upregulated in our microarray experiment after dox treatment (Figure 3—figure supplement 4C), and Nfe2 (Wilson et al., 2010; Woon Kim et al., 2011). Moreover, several of the targets had previously been identified as being differentially expressed following dox treatment (Figure 3—figure supplement 4C, Supplementary file 5). Single-cell transcriptomics analysis reveals the transcriptional networks involved in Pre-HSPCs generation. (A) Network built from gene correlations. Gpr56 is highlighted with a red asterisk. (B) Centrality values for all the genes containing a heptad peak within 1 kb of the TSS that are significantly above the median. Gpr56 is highlighted with a red asterisk. (C) The upper part shows the ChIP-Seq data for the seven TFs from the Wilson et al. (2010) study in the Gpr56 locus. The y-axis shows reads displayed as density plots, which were generated by Wilson et al. (2010) and visualized using the Integrated Genome Browser software. The two putative enhancers are highlighted with red rectangles. The lower part shows the results of the transcriptional reporter assay for two potential heptad enhancers in Gpr56 locus using i8TFs ESCs treated for 24 hr with doxycycline. Error bars represent standard deviations (n = 3). See also Figure 6—figure supplement 1 and Supplementary file 11. Encouraged by the results from the dcor analysis, we carried out a genome-wide analysis. Since Dcor is a slow correlation method, it was computationally infeasible to calculate the global network with it. That is why we used Spearman correlation, a very fast correlation method. We combined the two datasets and kept all correlations where the absolute value of the average correlation was greater than 0.25 and where the sign was consistent across Remove Unwanted Variation (RUV) and Size Factors (SF) normalizations. This resulted in a network containing 7,262 genes and 163,474 edges of which 123,394 were positive and 40,080 negative. Importantly, 11 genes out of the 13 seed genes used in the previous analysis where found in this large network: Cbfa2t3, Fli1, Gata2, Lmo2, Erg, Tal1, Gfi1b, Gata1, Runx1, Spi1 and Lyl1. In addition, among the 145 genes containing heptad peaks within 1 kb of their TSS, 26 were found in the network, although this was not significantly more than expected by chance (p>0.1, Fisher-exact test). To identify the most important genes in the network, we calculated three different centrality measures (degree, betweenness and eigen) (Figure 6B). The number of genes among the 11 seed genes with values above the median was significantly higher than that expected by chance for all three measures (degree p-value=0.0005, betweenness p-value=0.006, eigen p-value=0.03). Interestingly, for the 26 heptad targets, only the betweenness presented a higher number of targets above the median than would be expected by chance (p-value=0.04). This highlights the expected central role of the heptad targets by their position ‘in between’ the main players of the network. As Grp56 appeared as a top candidate in our two network analyses, we chose it for further experiments (Figure 6C). Gpr56 has been shown to be expressed in the hematopoietic clusters of the aorta (Solaimani Kartalaei et al., 2015) and to be upregulated along the EHT (Goode et al., 2016). ChIP-seq data (Wilson et al., 2010) show that there are two Gpr56 regulatory elements bound by seven out of the eight TFs in the HPC7 cell line (Figure 6C). We selected these putative enhancers and cloned them in a plasmid upstream of the Firefly luciferase reporter gene. A gene reporter assay in the i8TFs ESC line demonstrated that the induction of the eight TFs led to a strong increase in luciferase gene expression with the two Grp56 enhancers (Figure 6C). In conclusion, we were able to infer GRNs based on sc-RNA-seq data. We identified the key players affected by the induction of the eight TFs, among which Gpr56 was a major target gene. The simultaneous expression of the eight factors led to the formation of a population resembling Pre-HSPCs through their specific action on GRNs. It was not clear, however, why the cells were blocked in this normally ‘transient’ intermediate stage of the EHT. To unravel this, we applied our network analysis to a sc-RNA-seq dataset of endothelial cells and HSPCs, before and after the EHT, respectively (Pereira et al., 2016). We generated a network using the same seeds as before (Figure 6A), and the most striking feature of the new network is that Fli1 and Runx1 share several targets, but with opposing directions of correlation (Figure 7A). A genome-wide network analysis based on Spearman correlations showed a similar pattern in which 210 genes were correlated to both Fli1 and Runx1 but in opposite directions (Figure 7B and Supplementary file 9). Furthermore, GO analysis revealed that genes whose expression is positively correlated with Fli1 and negatively correlated with Runx1 (yellow rectangle) are enriched for the terms vascular development, angiogenesis and cell migration (Figure 7—figure supplement 1A). On the other hand, genes whose expression is positively correlated with that of Runx1 and negatively correlated with that of Fli1 (green rectangle) are associated with the GO term immune system process (Figure 7—figure supplement 1A). Hence, Runx1 is more associated with hematopoietic genes whereas Fli1 is more associated with vascular genes. Interestingly, ChIP-seq data from Wilson et al. (2010) showed that 77 out of the 210 are direct targets of both Runx1 and Fli1 (Figure 7—figure supplement 1B and Supplementary file 9). The observed opposite correlation could be due to the fact that most endothelial cells express only Fli1 and not Runx1, while HSPC co-express Runx1 and Fli1. There is indeed a clear shift in the relative expression of Fli1 compared to that of Runx1 between the two cellular stages (Figure 7—figure supplement 1C). 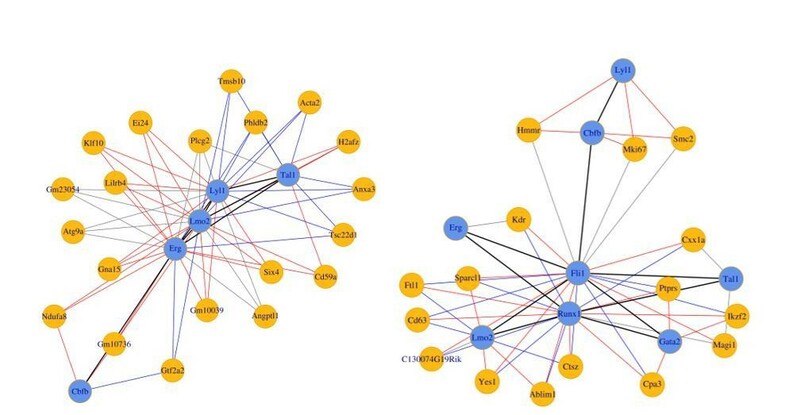 In conclusion, our network analysis revealed that Fli1 and Runx1 are connected to 210 genes but with opposite correlations, which might be linked to the contrasting expression patterns of Fli1 and Runx1 and/or to the opposing functional properties of these TFs. Single-cell transcriptome analysis suggests that Runx1 and Fli1 have opposite functions during EHT. (A) Network built from gene correlations found in the Peirera dataset (Pereira et al., 2016). 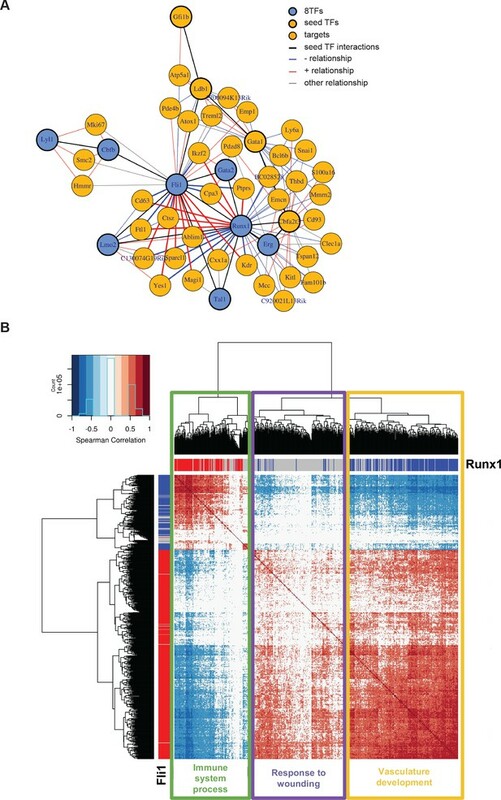 (B) Heatmap displaying Spearman correlations between the 210 genes found to be correlated to Runx1 and Fli1. The hierarchical clustering analysis gave us three groups of genes highlighted by three rectangles of different colors. The top GO term for each group of genes is indicated. See also Figure 7—figure supplement 1 and Supplementary file 9. To find out whether Runx1 and Fli1 have opposite functional effects on the cell fate decisions occurring during EHT, we re-examined our i1TF gain-of-function analysis (Figure 3—figure supplement 5 and Figure 4B). According to these results, we identified two main groups of TFs. The first one includes Fli1 and Erg while the second one includes Runx1 and Gata2. Indeed, in +dox condition, iFli1 and iErg both displayed an increase in Endo population as well as Pre-HSPCs population, although at much lower level than with i8TFs (Figure 4B). By contrast, iRunx1 and iGata2 cells showed an increased frequency in the EryPCs_II population and a decrease in the MyePCs population in the +dox condition (Figure 4B). This result is consistent with the hypothesis that some of the eight TFs have opposing effects. We next evaluated the functional consequences of the removal of Runx1/Gata2 or Erg/Fli1 from the 8TFs construct. We hypothesized that removing Runx1 and Gata2 would enhance the endothelial cell fate, whereas removing Erg and Fli1 would increase the hematopoietic cell fate. We consequently generated two additional ESC lines (Figure 8A). The first, i6TFs, contains 6TFs that are also found in i8TFs but is without Erg and Fli1. The second, i5TFs, lacks Runx1, Gata2 as well as Cbfb, crucial partner of Runx1. We performed ESC differentiation of these cell lines in the same way as before and analyzed the consequences of the overexpression of these two sets of TFs. 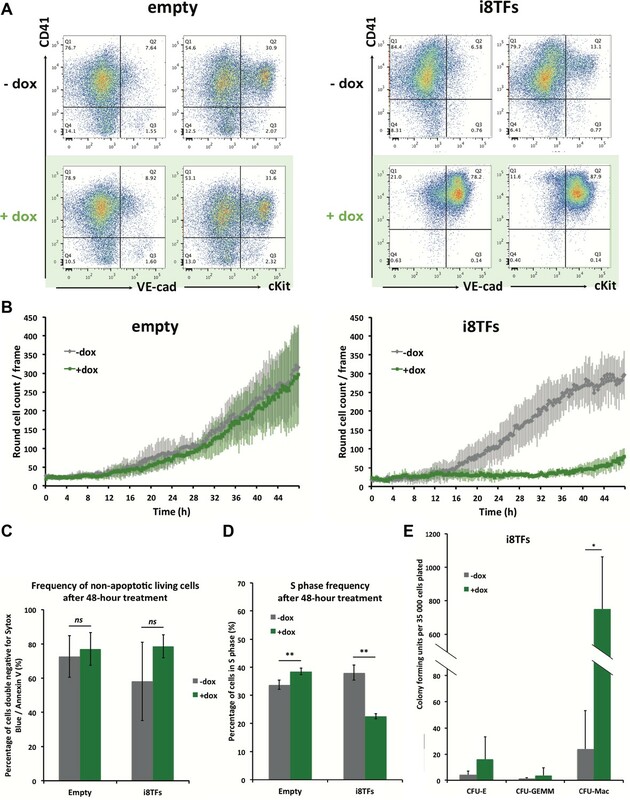 Interestingly, the overexpression of the five TFs partly recapitulated the effect of overexpressing the eight TFs and led to a clear increase of the frequency of VE-cad+ CD41+ (Figure 8B). Remarkably, the frequency of the VE-Cad+ CD41– population was significantly increased too, in stark contrast to what we observed with the eight TFs (Figure 3A and Figure 8B). Consistent with this result, there was a clear decrease of the number of round cells formed during the BL-CFC assay (Figure 8C). By contrast, the overexpression of the six TFs only had a minor impact on the expression pattern of VE-cad and CD41 (Figure 8B). However, there was a clear increase of round hematopoietic cells as shown by image analysis, suggesting an enhancement of blood cell formation (Figure 8C). The observed impact of the induction on the number of round cells was confirmed specifically with endothelial cells isolated at day 1 BL-CFC and cultured for two days in the presence of doxycycline in HE medium (Figure 8D and Figure 8—figure supplement 1A). In addition, sc-q-RT-PCR performed on the i5TFs and i6TFs confirmed this duality (Figure 8E and Figure 8—figure supplement 1B). The i5TFs showed a decrease of EryPCs_I hematopoietic progenitors that was associated with an increase in Endo and Pre-HSPC populations, whereas the i6TFs showed an increase in the EryPCs_II population of hematopoietic progenitors (Figure 8E and Supplementary file 10). The Erg/Fli1 and Runx1/Gata2 groups of transcription factors have opposite functions during EHT. (A) Scheme showing the i5TFs and i6TFs constructs used to generate the two inducible ESC lines missing Runx1, Gata2 and Cbfb, or Fli1 and Erg (respectively). (B) Representative FACS plots of VE-Cad, cKit and CD41 expression following three days of BL-CFC culture of the indicated ESC lines (n = 3). (C) Graphs showing the average numbers of round cells counted per frame (n = 3) in a 48 hr time course for the indicated ESC lines. Error bars represent standard deviations. (D) Representative pictures taken two days after HE culture of sorted VE-Cad+ CD41– (Endo) cells for the indicated cell lines. Round cells correspond to blood cells. The scale bar corresponds to 100 μm. (E) Bar graphs displaying the sc-q-RT-PCR results for the i6TFs and i5TFs ESC lines. See also Figure 8—figure supplement 1, Supplementary files 1, 10 and 11. In conclusion, these results suggest that Fli1 and Erg on one side and Runx1 and Gata2 on the other side have opposing effects on the cell-fate decisions in hematopoiesis leading to the formation of Pre-HSPCs. In this study, we used single-cell transcriptomics to define three main populations in the embryonic vasculature during blood formation: endothelial cells, pre-hematopoietic stem/progenitor cells and hematopoietic stem/progenitor cells. While these results were initially obtained with a single batch of embryos, all key patterns were reproduced in a separate batch in an additional study (Morgan Oatley, unpublished results). Despite slight timing differences, there were strong similarities in gene expression between the yolk sac and the AGM EHT, suggesting a similar process in both sites. However, due to the blood circulation, we cannot rule out cellular exchange between these two sites. Bulk ChIP-seq analyses have suggested that Erg, Fli1, Tal1, Lyl1, Lmo2, Runx1 and Gata2 work together as a heptad (Wilson et al., 2010). Here, we show for the first time that the heptad genes are specifically co-expressed at the single-cell level within the Pre-HSPCs, and that this combination was not found in any other population along the transition. This specific co-expression may be conserved in the human species, as it was shown recently in the in vitro human EHT model system that the intermediate population between endothelial and blood cells co-expresses Runx1, Lyl1, Tal1, Gata2, Erg and Fli1 (Lmo2 was not assessed) at the single-cell level (Guibentif et al., 2017) similarly to the Pre-HSPC population that we described. In contrast to Guibentif et al. (2017), we investigated the functional meaning of the co-expression of these transcription factors. We showed that their enforced expression, together with that of Cbfb, during hematopoietic differentiation gave rise to Pre-HSPCs in culture. This suggests that the co-expression of the heptad genes is necessary for cells to reach the transient Pre-HSPCs stage before pursuing the transition. These findings are consistent with the hypothesis of the existence of a heptad protein complex. 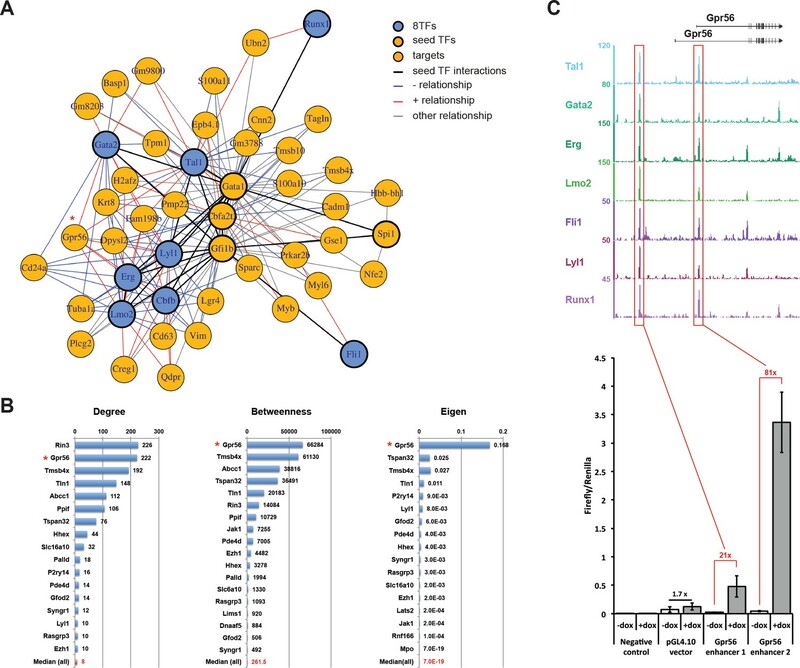 Surprisingly, only ten percent of the differentially expressed genes are heptad targets and only ten percent of the heptad targets are differentially expressed. This suggests that the gene expression changes that we observed were not a direct consequence of the binding of the eight TFs complex at the regulatory elements of these genes. This implies that the formation of Pre-HSPCs is probably due to a combination of individual functions acting on the GRNs rather than to the sole action of an eight-protein complex. To define these GRNs, we developed a bioinformatics pipeline for sc-RNA-seq data. We characterized the tight relationships involved in the formation of Pre-HSPCs, thereby giving directionality to the protein–DNA interactions previously identified by ChIP-seq (Goode et al., 2016; Wilson et al., 2010). Network analyses of the Pereira dataset (Pereira et al., 2016) together with our in vitro results revealed a new and unexpected opposite relationship between Runx1 and Fli1 functions. In addition, this network suggests that Gata2 and Lmo2 might act as cooperative co-regulators with Runx1 and Fli1, respectively (Figure 7A). On the basis of our data and what is known in the literature, we propose the following model (Figure 9). Initially, the endothelial cell fate program is driven by Erg and Fli1, both ETS transcription factors, which is consistent with our functional analyses (Figure 3—figure supplement 5D and Figure 4) and studies published before (Asano et al., 2010; McLaughlin et al., 2001). In addition, Wilson et al. (2010) showed that more than 90% of the loci targeted by Fli1 are also targeted by Erg in the HPC7 cell line, suggesting functional redundancy. Then, the expression of Runx1 commenses and this — along with the expression of Gata2, which has pro-hematopoietic function — initiates the hematopoietic transcriptional program . Previous data support this functional interaction as Runx1+/−::Gata2+/− compound heterozygous embryos are not viable due to their severe hematopoietic defects, reinforcing the notion that the two proteins are involved in the same biological process (Wilson et al., 2010). At this intermediate Pre-HSPCs stage, endothelial genes are progressively downregulated as shown by our data. As Fli1 and Erg gene expression remain stable between the Endo and the Pre-HSPCs stages, this could be explained by a functional switch for these factors in favor of the hematopoietic cell fate and a decrease in the fraction dedicated to the maintenance of the endothelial program at the single-cell level. Specifically, Fli1 may be involved both in endothelial and hematopoietic gene expression depending on the cellular context. Indeed, in presence of Runx1, Fli1 could potentially activate common target genes such as Gfi1 and Gfi1b, which are involved in the repression of endothelial gene expression (Lancrin et al., 2012; Thambyrajah et al., 2016; Wilson et al., 2010). Alternatively (or concomitantly), Runx1 and Fli1 could bind together on endothelial gene loci as shown for Sox17 (Lichtinger et al., 2012) and repress their expression. On the other hand, Fli1 could switch its function upon physical interaction with Runx1, as shown during megakaryocytic differentiation where there is a synergistic transcriptional activation upon Fli1–Runx1 interaction (Huang et al., 2009). Model for the dynamical function of transcription factors during the formation of blood stem and progenitor cells. Proposed model for the dynamical function of transcription factors during the endothelial to hematopoietic transition. The upper blue arrow section shows the balance between transcription factors along the transition. The middle section indicates the gene expression levels for the two sets of transcription factors. In the lower blue arrow section, a possible mechanism for the functional switch of Erg/Fli1 in presence of Runx1/Gata2 is depicted. During the transition, epigenetically closed hematopoietic gene loci are progressively opened and activated in the presence of Runx1/Gata2 together with Fli1/Erg while the endothelial loci are progressively closed through Gfi1 and Gfi1b transcriptional repression. The DNA-binding data combined with single-cell GRN analysis suggests a dual function for Fli1 that is dependent on the cellular context (see main text for full description). At the end of the EHT, in the HSPCs, the endothelial program is completely suppressed along with the expression of Erg. At this development stage, Fli1 is fully dedicated to the hematopoietic cell fate program and works with Runx1 to carry on blood cell development. This is supported by the observation that almost all the Runx1 target genes specific to the HSPCs are also bound by Fli1 (Supplementary file 9). In conclusion, our work gives an important insight into the switch between endothelial and hematopoietic cell fates that is required for blood cell formation. We have identified the Pre-HSPCs as the pivotal stage in this process, at which a competition between developmental programs takes place at the single-cell level. The expression of the heptad of TFs is directly linked to this transitional stage. The balance of activity of Erg, Fli1, Gata2 and Runx1 appears to have the most important role in the EHT, whereas the Tal1/Lmo2/Lyl1 axis might have an essential role in priming it. Indeed, Tal1 acts as a repressor of alternative cellular programs such as the cardiac lineage and is actively needed to initiate the EHT (Lancrin et al., 2009; Org et al., 2015). In this context, our single-cell transcriptomics approach allowed us to shed light on an unexpected change in Fli1 activity as a consequence of Runx1 expression. This appears to be a critical process for the proper completion of the EHT. Conditions reinforcing the interaction between Runx1 and Fli1 would probably help to tilt the balance towards the hematopoietic cell fate. Likewise, preventing the Fli1–Runx1 interaction could potentially impair the formation of blood cells from endothelium. More generally, a dual competing function for a unique transcription factor might be a key process for other developmental transitions such as the epithelial to mesenchymal transition. The bioinformatics approach that we have used in this work could be readily applicable to the study of other developmental processes and could help to address this type of question. Finally, the discrepancy observed between bulk and single-cell analyses in this work could also exist in other studies of TF complexes, which could prompt researchers in different fields to revisit previous assumptions using our approach. C57BL/6 N, Gfi1:GFP (Yücel et al., 2004) and Gfi1b:GFP (Vassen et al., 2007) mouse lines were used. Gfi1+/GFP and Gfi1b+/GFP were crossed with each other to generate Gfi1+/GFPGfi1b+/GFP animals. These animals were then used for timed mating to generate Gfi1GFP/GFPGfi1bGFP/GFP double-knockout embryos. Timed mating was set up and the morning of vaginal plug detection was considered day 0.5. Embryos were staged according to morphological properties. All experiments were performed in accordance with the guidelines and regulations defined by the European and Italian legislations (Directives 2010/63/EU and DLGS 26/2014, respectively). All mice were bred and maintained at the EMBL Rome Mouse Facility in accordance with European and Italian legislations (EU Directives 634/2010 and DLGS 26/2014, respectively). All doxycycline-inducible ESC lines were generated using the inducible cassette exchange method described previously (Iacovino et al., 2011; Vargel et al., 2016). For iCbfb, iRunx1, iLmo2, iGata2 and iFli1 ESC lines, the transcription factor coding sequences were tagged in 5’ with an 8His-tag and amplified by PCR from differentiated ESC cDNA. The 8His-tagged coding sequences were then inserted into a pGEM-t-easy before cloning into the p2lox plasmid. For iTal1, iLyl1 and iErg, the 8His-tagged coding sequences were synthetized and cloned into a pUC57 Simple by the GenScript Gene Synthesis Service (http://www.genscript.com/ gene_synthesis.html). The 8His-tagged coding sequences were then cloned from the pUC57 Simple into the p2lox plasmid. For each of the generated p2lox plasmids, a Kozak sequence was then added at the start codon by PCR cloning. The subsequent p2lox plasmids were used to transfect the A2lox.Cre ESC line and to generate the eight single-factor inducible ESC line as previously described (Vargel et al., 2016). For the i8TFs ESC line, three individual constructs were synthetized and cloned into a pUC57 plasmid by the GenScript Gene Synthesis Service. Construct one was composed of the coding sequence for V5-Erg-T2A-V5-Lmo2. Construct two was composed of the coding sequence for HA-Tal1-T2A-cmyc-Fli1-T2A-FLAG-Lyl1-T2A. Construct three was composed of the coding sequence for FLAG-Runx1-T2A-FLAG-Cbfb-T2A-HA-Gata2-T2A. All three constructs were flanked by a start codon and two stop codons, together with the proper restriction sites for cloning into the p2lox plasmid, in order to allow their individual use. They also contain specific restriction sites for their excision, the addition of any of the other constructs, or the removal of any of the factor sequences. Construct one together with the start codon and two stop codons was cloned into the p2lox plasmid. Then, Construct two was added between the start codon and Construct one by classic cloning. Finally, Construct three was added between the start codon and Construct two to obtain the p2lox-8TFs. This plasmid was then transfected into the A2lox.Cre ESC line for the generation of the i8TFs. For the i5TFs, the intermediate p2lox construct containing Construct one and Construct two was used to generate the ESC line. For the i6TFs, V5-Erg and cmyc-Fli1 were successively excised from the p2lox-8TFs by classic cloning to generate the p2lox-6TFs used for the generation of the inducible ESC lines. The empty ESC line was generated using the basic p2lox plasmid and following the same procedure. For each inducible ESC line, a clone was selected based on the induction of the transcript expression measured by qPCR and validated by western blot analysis. All cell lines used in this work were mESC lines. The Runx1+/hCD4 mESC line was generated in the group of Georges Lacaud by the corresponding author, Christophe Lancrin (Sroczynska et al., 2009a). All A2lox.Cre-derived mESC lines were generated from the A2lox.Cre mESC line, which was a gift from Michael Kyba who produced it in his laboratory (Iacovino et al., 2011). All A2lox.Cre-derived mESC lines were generated in our laboratory as described in the section ‘Generation of inducible ESC lines’. All ESC lines had proper stem cell morphology and were able to give rise to blood and endothelial cells after in vitro differentiation (Figure 1D, Figure 3, Figure 3—figure supplements 1 and 5, Figure 8 and Figure 8—figure supplement 1A). All the inducible mESC lines were verified by western blots and qPCR analysis (Figure 2, Figure 3—figure supplement 5, Figure 4 and Figure 8—figure supplement 1B). All cell lines used in this manuscript were tested negative for mycoplasma contamination. Growth and differentiation of ESCs were performed as previously described (Sroczynska et al., 2009b). Briefly, ESCs were maintained on feeders in an ESC culture medium made of KnockOut DMEM (GIBCO) (supplemented with 1% Pen/Strep [GIBCO], 1% L-Glutamine [GIBCO] and 1% NEAA [GIBCO]), 15% FBS (PAA), 0.0024% 1 mg/ml LIF (The Protein Expression and Purification Core Facility, EMBL-Heidelberg) and 0.24% 50 mM 2-mercaptoethanol (GIBCO). For differentiation, ESCs were seeded on gelatin-coated plates (0.1% gelatin [BDH] in PBS for 20 min) for one day in the normal ESC culture medium and then for one day in a medium similar to the ESC medium but containing IMDM (Lonza) instead of the KnockOut DMEM and without NEAA supplement. To obtain embryoid bodies (EBs), cells were subsequently harvested and cultured in petri dishes at a density of 0.3 × 106 cells per 10 cm2 dish with an EB medium made of IMDM (Lonza) (supplemented with 1% Pen/Strep [GIBCO] and 1% L-glutamine [GIBCO]), 0.6% transferrin (Roche, Italy), 0.039% MTG (Sigma) and 50 mg/µl ascorbic acid (Sigma). After 3–3.25 days, EBs were harvested and Flk1+ cells were sorted using MACS MicroBead Technology (Miltenyi Biotec). For hemangioblast differentiation, Flk1+ cells were then cultured on gelatin-coated plates at a density of 0.01 × 106 cells per cm2 in a medium made of IMDM (Lonza), 1% Pen/Strep (GIBCO), 1% L-glutamine (GIBCO), 10% FBS (PAA), 0.6% transferrin (Roche), 0.039% MTG (Sigma), 0.5% ascorbic acid (Sigma), 15% D4T supernatant (EMBL-Monterotondo), 0.05% VEGF (10 µg/ml) (R and D) and 0.1% IL-6 (10 µg/ml) (R and D). During the hemangioblast differentiation, the cell population could be sorted and further cultured in hemogenic endothelium culture conditions. For this purpose, sorted cells were seeded on gelatin-coated plates at a density of 0.015 × 106 cells per cm2 in a specific medium made of IMDM (Lonza), 1% Pen/Strep (GIBCO), 1% L-glutamine (GIBCO), 10% FBS (PAA), 0.6% transferrin (Roche), 0.039% MTG (Sigma), 0.5% ascorbic acid (Sigma), 0.0024% LIF (EMBL-Heidelberg), 0.25% SCF (20 µg/ml) (R and D), 0.1% oncostatin M (10 µg/ml) (R and D) and 0.01% bFGF/FGF2 (10 µg/ml) (R and D). To pursue the differentiation with a hematopoietic progenitor assay, cells were collected three days after Flk1 sort from the hemangioblast (or the hemogenic endothelium) culture and plated at a density of 3.3 × 103 cells per cm2 in a medium made of IMDM (Lonza), 1% Pen/Strep (GIBCO), 1% L-glutamine (GIBCO), 55% of 0.5 g/ml methylcellulose (VWR), 15% PDS (Antec), 10% PFMH-II (GIBCO), 0.6% transferrin (Roche), 0.039% MTG (Sigma), 0.5% ascorbic acid (Sigma), 0.5% SCF (20 µg/ml) (R and D), 0.1% IL-3 (25 µg/ml) (R and D), 0.1% GM-CSF (25 µg/ml) (R and D), 0.04% IL-11 (12.5 µg/ml) (R and D), 0.2% EPO (10 µg/ml) (R and D), 0.2% IL-6 (5 µg/ml) (R and D), 0.2% TPO (12.5 µg/ml) (R and D) and 0.05% MCSF (10 µg/ml) (R and D). Colonies were counted for three replicates after 10–12 days. For doxycycline treatment of the inducible ESC line, doxycycline (Sigma) was added directly to the culture medium at a final concentration of 1 µg/ml for 24 or 48 hr. Yolk sac and AGM dissections were performed as described before (Bertrand et al., 2005) and Robin and Dzierzak, 2005). Briefly, pregnant mice were killed by cervical dislocation between E9.0 and E11 of gestation. Uterine horns were collected; the maternal tissues were removed as well as the placenta to isolate the embryos. The yolk sac was torn gently and separated from the embryo proper by tearing off the umbilical and vitelline arteries. Then, the somite pairs of the embryos were counted to determine their developmental stage. To isolate the AGM, the head, tail, limb buds, ventral organs and somites were removed. Yolk sac and AGM samples from the same embryonic development stage were pooled together in the same tube. To generate single-cell suspension from the isolated tissues, AGM and yolk sac samples were subjected to collagenase (Sigma) treatment for 30 min. at 37°C. AGM and yolk sac cell suspensions were then used for flow cytometry. ESCs were cultured for two passages on gelatin to remove MEFs before being treated with 1 µg/ml of doxycycline (Sigma) for 24 hr. For whole protein extracts, cells were harvested using TrypLE express (GIBCO), washed with PBS and lysed in RIPA buffer (Thermo Scientific) for 30 min at 4°C. Samples were then centrifuged for 5 min at high speed and pellets were discarded. Nuclear extracts were prepared using the Nuclear Extract kit (ActiveMotif) following the manufacturer's instructions. Protein concentration was measured using the Pierce BCA Protein Assay Kit (Thermo Scientific) and equal amounts of –dox and +dox protein samples were loaded onto NuPAGE Novex 10% or 12% Bis-Tris Protein gels (Life Technologies). Migration and wet transfer on a PROTRAN nitrocellulose membrane (PerkinElmer) were performed using the XCell SureLock Mini-Cell Electrophoresis System from Invitrogen. Membranes were stained with Ponceau S solution (Sigma) to control the transfer efficiency and protein amounts. The membranes were then washed with TBST (TBS [20 mM Tris-Base, 154 mM NaCl, pH 7.5], 0.1% Tween 20) and blocked with TBST +5% milk for 45 min at RT. Membranes were then incubated ON at 4°C with primary antibodies diluted in TBST +1% milk as follows: 1:2000 anti-FLAG (Sigma), 1:1000 anti-HA (Sigma), 1:2000 anti-V5 (Life Technologies), 1:5000 anti-Runx1 (Abcam), 1:5000 anti-Cbfb (Abcam), 1:2000 anti-Gata2 (Abcam), 1:2000 anti-Tal1 (Abcam), 1:2500 anti-Fli1 (Abcam), 1:5000 anti-Lyl1 (Abcam), 1:5000 anti-Erg (Abcam), 1:1000 anti-Lmo2 (Abcam), 1:2000 anti-His tag (Abcam), and 1:10000 anti-alpha-tubulin (Sigma) (the last being used as loading control). Following primary antibody incubation, the membranes were washed three times with TBST and incubated for 45 min with HRP-conjugated secondary antibodies diluted in TBST +1% nilk as follows: 1:10000 anti-Mouse HRP (GE Healthcare Life Sciences), 1:10000 anti-Rabbit HRP (Jackson) and 1:10000 anti-Rat HRP (GE Healthcare Life Sciences). The membranes were developed using the Amersham ECL Prime Western Blotting Detection Reagent (GE Healthcare Life Sciences). Staining was done as described previously (Sroczynska et al., 2009b) and analyses were performed with a FACSCanto (Becton Dickinson) or a FACSAria (Becton Dickinson). Cell sorts were performed with a FACSAria (Becton Dickinson) or by using magnetic sorting (MACS MicroBead Technology, Miltenyi Biotec) and anti-APC MicroBeads (Miltenyi Biotech). The monoclonal rat anti-mouse antibodies used were anti-Mouse CD309 (FLK1) APC (Avas12a1, eBioscience), anti-Mouse CD41 PE (MWReg30, eBioscience), anti-Mouse cKit APC (2B8, eBioscience), and anti-Mouse CD144 (VE-Cadherin) eFluor 660 (eBioBV13, eBioscience). FACS data were analyzed using the FlowJo software (Tree Star, Inc.). Cell-cycle assays were performed using the Click-iT Plus EdU Alexa Fluor 488 Flow Cytometry Assay kit from Molecular Probes following the manufacturer instructions. Briefly, cells from hemangioblast, or hemogenic endothelium, culture were treated with 10 µM of EdU for 1 hr. The cells were then harvested and stained with Ghost Dye Red 780 (Tonbo Biosciences) for live/dead staining before staining with cell surface marker antibodies (anti-Mouse CD41 PE [MWReg30, eBioscience] and anti-Mouse CD144 [VE-Cadherin] eFluor 660 [eBioBV13, eBioscience]). Stained cells were fixed and permeabilized, and the Click-IT reaction was performed following the manufacturer instructions. Finally, cells were stained with Hoechst for DNA labeling and analyzed with the FACSAria (Becton Dickinson). FACS data were analyzed using the FlowJo software (Tree Star, Inc.). Cells from hemangioblast culture were harvested and stained with anti-Mouse CD41 PE (MWReg30, eBioscience), anti-Mouse CD144 (VE-Cadherin) eFluor 660 (eBioBV13, eBioscience) and AnnexinV (eBioscience). Finally, cells were stained with Sytox Blue for DNA labeling and analyzed with the FACSAria (Becton Dickinson). FACS data were analyzed using the FlowJo software (Tree Star, Inc.). Sequences from the two heptad peaks found in the Gpr56 locus (Wilson et al., 2010) were synthesized and cloned by the GenScript Gene Synthesis Service into a pGL4.10[luc2] reporter plasmid (Promega), with additional 50-bp sequences upstream and downstream to ensure proper peak coverage. The pGL4.74[hRluc/TK] Renilla reporter plasmid that was used to control for transfection efficiency was obtained from Promega. ESCs were plated on gelatin-coated plates (0.1% gelatin [BDH] in PBS for 20 min) and passaged twice to remove the feeders. Cells were then seeded in gelatin-coated 96-well plates at a density of 5,000 cells per well. Next day, the medium was changed and the cells were transfected with the Firefly luciferase reporter plasmids together with the Renilla luciferase reporter plasmid using the NanoJuice Transfection kit (Merck Millipore). After 24 hr, cells were treated with doxycycline (Sigma) for 24 hr and luciferase assay was performed using the Dual-Luciferase Reporter Assay System (Promega) and the POLARstar Omega device (BMG Labtech) following manufacturer's instructions. Cells were collected and washed once with PBS. Total RNA was extracted with RNAeasy Plus Micro kit (Qiagen). Samples were then tested for quality with BioAnalyzer (Agilent) and their concentrations measured using Qubit (Life Technologies). They were hybridized on an Affymetrix GeneChip Mouse Gene 2.0 ST Array. A maximum of 1 day prior to the experiment, 96-well plates (BioRad) were filled with 5 µl of 2x reaction mix from the CellsDirect One-Step qRT-PCR kit (Invitrogen). On the day of the experiment, cells were harvested and stained for FACS analysis. Cells from Anti-Mouse CD41 PE (MWReg30, eBioscience)/Anti Mouse CD144 (VE-cadherin) eFluor 660 (eBioBV13, eBioscience) staining were single-cell sorted in the pre-filled 96-well plates (BioRad) using the FACSAria system (Becton Dickinson). The plates were snap-frozen on dry ice immediately after sorting and stored at −80°C for a maximum of 1 week. To perform RT/Specific Target Amplification (RT/STA), 4 µl of a reaction mix — composed of 2.8 µl of Resuspension buffer, 0.2 µl of SuperScript III and Platinum Taq polymerase from the CellsDirect One-Step qRT-PCR kit (Invitrogen) and 1 µl of 500 nM outer primer mix (primer sequence list, see table below) — was added to each well. Plates were first incubated at 50°C for 15 min. followed by incubation at 95°C for 2 min. Then, they were incubated at 95°C for 15 s. followed by incubation at 60°C for 4 min. for 20 cycles. To prepare the sample mixes, 1/5x diluted cDNAs were mixed wiyj the loading reagent (Fluidigm) and SsoFastTM EvaGreen Supermix (Bio-Rad). In parallel, individual assay mixes were prepared as 5 μM inner primer mix, with DNA suspension buffer and the assay loading reagent (Fluidigm). After the priming of 96.96 dynamic array IFC (Fluidigm), the sample mixes and assay mixes were put together in the corresponding inlets and loaded into the chip. Finally, the chip was run in the Fluidigm Biomark HD system by using the Biomark Data Collection Software and the GE96 ×96PCR + Meltv2.pcl program. To control for technical variation in our sc-qRT-PCR runs, we used the universal cDNA reverse transcribed by Random Hexamer: Mouse Normal Tissues (BioChain). It allowed us to detect consistently 93 out of our 95 genes of interest. A sample without DNA template was also run each time to test for unspecific PCR amplification. After 6,500 cells in 13 µl of PBS were obtained using FACS enrichment, Fluidigm Suspension Reagent was added in a 3:2 ratio and gently mixed by pipetting. A Fluidigm C1 10–17 uM IFC Chip was primed, 5 µl of cell suspension mix was added to the cell inlet, and the chip was loaded into the C1 instrument. Annotation of cell capture was carried out on a brightfield microscope at 40x magnification and each captured site was noted for having single-cell capture, doublet cell capture or debris. Lysis, reverse transcription, and PCR reagents (Clontech Takara) were then loaded into appropriate inlets as per Fluidigm layout. ERCC spike-in controls (Ambion) were added at a dilution of 1:4000 within the lysis mix to gain limit of detection and normalization in downstream analysis. The IFC was loaded into the C1 instrument overnight using the mRNA-Seq RT and the Amp script, and ~3 µl of cDNA was harvested and diluted in 5 µl of Fluidigm C1 DNA dilution buffer. Size distribution and quantification of individual cDNA samples was obtained using an AATI Fragment Analyzer (AATI) and the cDNA concentration was diluted to 100 pg/µl in 10 mM Tris HCl pH 8.0 for library preparation. Illumina library preparation was carried out using the Nextera XT DNA system (Illumina), but volumes were reduced as per the modified Fluidigm C1 protocol. Tagmentation was performed on all 96 samples using 1.25 µl of cDNA (125 pg total concentration) combined with 2.5 µl of tagmentation buffer (TD) and 1.25 µl of Amplicon Tagment Mix (ATM), and incubated for 10 min at 55 degrees. After incubation, 1.25 µl of Neutrilize Tagment Mix (NT) was added. Illumina PCR barcoded indexes were combined to obtain 96 distinct combinations of i7 and i5 barcodes, and 2.5 µl of combined index was added along with 3.75 µl of Nextera PCR Mix (NPM). Samples were then put through 12 cycles of PCR as per the Illumina protocol. Each column was then pooled into a 0.2 mL 8-strip PCR tube and Ampure XP purification was performed, after which each pool was combined to obtain a single 96-sample multiplexed pool of barcoded library. The final sequencing library was quantified by Qubit (Life Technologies) and size distribution was measured on an Agilent BioAnalyzer. Samples were sequenced with the Illumina HiSeq 2000. Cells were stained with the Cell Viability Imaging kit (Molecular Probes), which contains Hoechst 33342 and propidium iodide, and afterwards were counted with the Moxi Z Mini Automated Cell Counter (ORFLO). Stained cell solution was diluted in a mix with diluent and RNase inhibitor (New England Biolabs) to 1 cell/50 nl for dispensing on the ICell8-chip (Wafergen) with the MultiSample NanoDispenser (Wafergen). Positive and negative controls were prepared according to the ICell8 protocol and dispensed with the MSND into the respective nanowells of the chip. All nanowells of the ICell8 chip were imaged with a fluorescence microscope (Olympus). The images were analyzed with the CellSelect software (Wafergen). Alive single cells, which are Hoechst-33342-positive and propidium-iodide-negative, were selected for lysis and reverse transcription inside the ICell8 chip (200 cells i8TFs + dox, 150 cells i8TFs –dox, 150 Empty –dox and 150 Empty +dox). RT reaction mix containing 5X RT buffer, dNTPs, RT e5-oligo (Wafergen), nuclease-free water, Maxima H Minus RT (Thermo Scientific) and Triton X-100 was prepared and dispensed into the previously selected nanowells with single cells inside. The chip was placed inside a modified SmartChip Cycler (Bio-Rad) for the RT reaction (42°C for 90 min, 85°C for 5 min, 4°C forever). The cDNA of all single cells was collected together and further concentrated with the DNA Clean and Concentrator−5 kit (Zymo Research). The Exonuclease I (New England Biolabs) reaction of the cDNA (37°C for 30 min, 80°C for 20 min, 4°C forever) was performed inside a conventional thermal cycler. Afterwards, the cDNA was amplified with the Advantage 2 PCR Kit (Clontech Takara) containing buffer, dNTPs, Amp Primer (Wafergen), polymerase mix and nuclease-free water (95°C for 1 min, 18 cycles of 95°C for 15 s, 65°C for 30 s and 68°C for 6 min, followed by 72°C for 10 min and 4°C forever). The amplified cDNA was purified with Ampure XP Beads (Beckmann Coulter). The cDNA size distribution was obtained with the High Sensitivity DNA BioAnalyzer (Agilent) and quantification was performed with the Qubit (Life Technologies). Illumina library preparation was carried out by using Nextera XT DNA (Illumina). Tagmentation was performed in tagment DNA buffer, Amplicon Tagment Mix and 1 ng of purified cDNA (55°C for 5 min and 10°C forever), next Neutralize Tagment Buffer was added (room temperature for 5 min). After incubation, the NexteraXT PCR reaction mix was prepared with Nextera PCR Mastermix, i7 Index Primer from the Nextera Index Kit (Illumina), Nextera Primer P5 and Tagmented cDNA-NT buffer mix (72°C for 3 min, 95°C for 30 s, 12 cycles of 95°C for 10 s, 55°C for 30 s and 72°C for 30 s, final 72°C for 5 min and 10°C forever). Ampure XP purification was performed with the finished library. The size distribution was checked on an Agilent BioAnalyzer. Samples were sequenced with the Illumina NextSeq. All GO term enrichment analyses were performed using the g:Profiler web server (Reimand et al., 2016). All flow cytometry experiments were independently repeated three times. For Figure 3C and Figure 3D, paired t-test was performed on the cell frequencies. For Figure 3—figure supplement 5D, frequencies for each population were plotted using JMP software (SAS). Error bars correspond to standard deviations. Log2ex = 0, if Ct is equal to or greater than LOD. Where the default is 24 (the typical Ct value for a single copy of input in the Fluidigm chip). In our case, the Ct value is a relative expression and does not have unit. Hence, following conversion to the Log2ex domain, we labelled the resulting values ‘Log2 Gene Expression’. Hierarchical clustering and PCA analyses were performed with the HC() and PCA() functions of this package. The HC function clusters genes by the Pearson Correlation method, that is, co-profiled genes are clustered together and samples are clustered by normalized Euclidian distance (distance/number of genes), representing the average fold change. The HC analysis uses the ‘complete linkage’ method (a bottom-up method) to find similar clusters. The ‘global_z_score’ display option normalizes the expression value using the global mean and the global standard deviation. The gene expression average of hematopoietic and endothelial genes is shown for each single cell in Figure 1—figure supplement 3. The hematopoietic average is based on the genes Epo, Epor, Gata1, Gata2, Gfi1, Gfi1b, Hbb-bh1, Itga2b, Itgam, Itgb3, Kit, Lmo2, Lyl1, Mpo, Myb, Ptprc, Runx1, Sfpi1, Sla, Tal1 and Thpo and the endothelial average on Cdh5, Cldn5, Eng, Esam, Fbn1, Gpr126, Kdr, Npr1, Pcdh12, Pecam1, Ptprb, Ptprm, Ramp2, Sox7 and Tek. A prototype was calculated for each cluster group of single cells determined by the hierarchical clustering result shown in Figure 1—figure supplements 1 and 2. The prototype is defined by the average of all cells belonging to its cluster. The Pearson correlation coefficient between all pairwise prototypes is visualized in Figure 1—figure supplement 4A. The R package ComplexHeatmap was used (Gu et al., 2016). A generalized linear model with Quasi-Poisson distribution and logarithm as the link function was applied to model the count table data as shown in Figure 4B. Six control groups were defined, one for each cell cluster category such as Endo or VSM. Each control group comprises 10 samples and includes all –dox conditions. 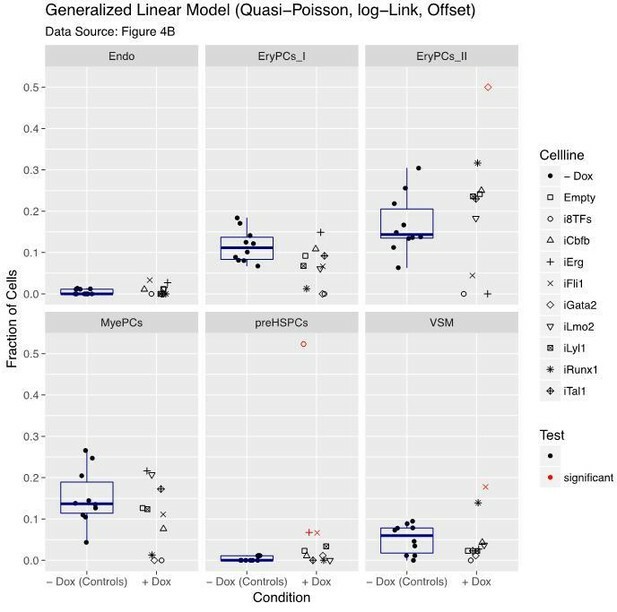 For each cluster category and for each of the overexpression cell lines, the count of the +dox condition was compared to the counts in its respective control group. Out of these 60 statistical contrasts (six cluster categories times nine overexpression cell lines plus the cell line carrying an empty vector) five were identified to be significantly different with an adjusted p-value<0.05. The method of Benjamini-Hochberg was used for the multiple testing correction. In addition, the generalized linear model included an offset to model rates instead of counts. The rates account for small differences in the total number of cells measured on each of the processed well plates. All five significantly different conditions are marked with a star in Figure 4B (see Supplementary file 6 for p-values). The mRNA microarray data were analyzed using oligo, phylobase, methods, biobase, stats, ggplot2, gplots, matrixstats, graphics, annotationdbi and limma packages in R (R Core Team , 2016). Each library was sequenced generating 426,065,795 and 440,774,932 paired-end reads (of 125 bp). Reads were assigned to the well with the matching barcode. Up to two mismatches are tolerated within the well barcode if the assignment remained non-ambiguous. STAR, version 2.4.0 (Dobin et al., 2013), aligned the reads to the mouse genome build mm10/GRCm38. Duplicate reads were removed using samtools, version 0.1.18 (Li et al., 2009). Wells with fewer than 1 million reads were deemed to be empty wells and excluded from further analysis (2 and 1, respectively). Reads with a minimum mapping quality of 30, which mapped to a unique gene, were counted using featureCounts, version 1.4.6 (Liao et al., 2014). Read counts were normalized using RUVg, version 1.0.0 (Risso et al., 2014), using ERCC spike-in controls and size-factors (SF) as defined in DESeq (Anders and Huber, 2010). Cells with >7% of reads mapped to rRNA (three in each plate) and which were outliers on the basis of the first principal component after size factor normalization were excluded. The remaining cells all contained >7,000 detected genes and were used in all subsequent analyses. We performed a network analysis using the generalized distance correlation measure, dcor statistic (Székely et al., 2007), together with its conditional version, pdcor (Székely and Rizzo, 2014). For each chip and each normalization method (four configurations), all significant relationships between the transcriptome and the seed genes were identified using the dcor statistic. The seed genes used for this analysis included the 8 TFs as well as Gata1, Gfi1b, Spi1, Ldb1 and Cbfa2t3. The additional seed genes were selected if they appeared in networks published by at least two different authors (Beck et al., 2013; Bonzanni et al., 2013; Moignard et al., 2013; Moignard et al., 2015; Tanaka et al., 2012). The directionality of the relationships (positive correlation, negative correlation or ‘other’) was defined using a two-tailed t-test, direct was based on the sign of the test and ‘other’ was assigned to all genes with uncorrected p-value>0.05. To ensure robustness, we only included relationships that were identified in at least two of the four configurations, and any relationships with conflicting directionalities were assigned to ‘other’. Finally, interactions between seed genes were identified by conditioning the ‘targets’ of each seed gene on the expression of each other seed gene. An interaction was inferred if the relationships between both seed genes and a particular ‘target’ gene increased in strength when conditioned on the other seed gene. For the Spearman network analysis, we combined Exp1 and Exp2 into a single expression matrix for each normalization (SF and RUV). We calculated Spearman correlations using base R-function for each normalization and we averaged the correlations across the two normalizations. We changed all correlations with absolute value <0.25 (i.e <0.25 and >−0.25) to 0. We created a network with weighted edges between genes, correlations of 0 = no edge. We calculated eigen centrality using eigen_centrality from the igraph R package (Bonacich, 1987). 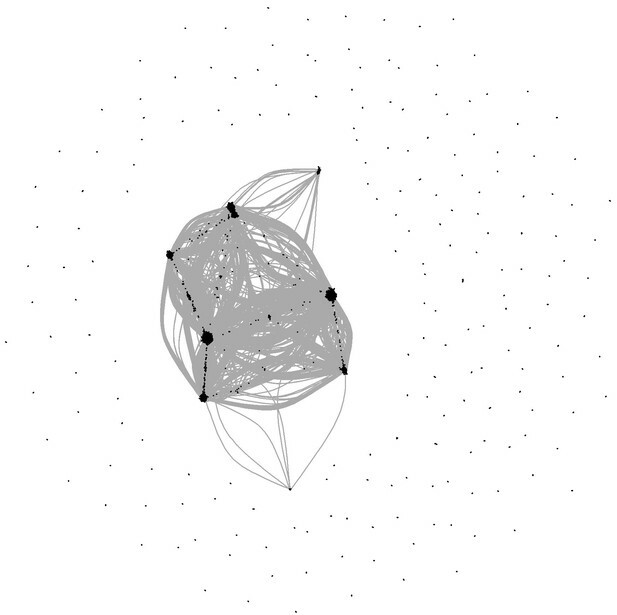 We took the absolute value of all edges (turns all relationships to be positive) and calculated betweenness centrality (number of shortest paths passing through a node) using betweenness from the igraph R package (Brandes, 2001). We calculated degree (number of edges attached to a node) using degree from the igraph R package. Then, we calculated the median value of each measure across all genes in the network. We counted the number of genes in the list that are above the median and we tested the significance of this using a binomial test (by definition 50% of genes are above the median). 673 wells on the Wafergen chip passed microscopic inspection. Pooling, library construction and sequencing generated 179 million paired-end sequences using the Illumina Nextera protocol. Note that this shallower sequencing greatly reduces the detection rate of TFs, but the larger number of cells facilitated evaluation of heterogeneity within and between populations. The first read of the pair encodes the well barcode and the UMI (unique molecular identifier) barcode, the second encodes the 3′ end of the transcript. Reads were assigned to the well with the matching barcode. Up to two mismatches are tolerated within the well barcode if the assignment remained non-ambiguous. Cutadapt trimmed poly-A, poly-G and adapter sequences and STAR aligned the reads to the mouse genome build mm10 (Dobin et al., 2013; Martin, 2011). FeatureCounts determined all reads in a strand-specific way so that they overlap with exactly one gene (Liao et al., 2014). Gene expression levels are calculated by counting the number of distinct UMIs of all gene specific reads (‘UMIs per gene’), as determined by featureCounts. Only uniquely aligned reads were counted. To further reduce the impact of mapping and sequencing errors on the quantification, an UMI barcode error correction and filtering step was introduced. If two or more of the distinct UMIs per gene share a similar barcode, differing by at most one or two mismatches, then they may originate from the same UMI barcode. The UMI barcode is corrected only if it has less than 10% of reads compared to the most abundant one. This correction procedure starts with the UMI barcode, which is supported by the highest number of gene-specific reads, and which determines all similar barcodes and corrects them if applicable. It restarts with all UMI barcodes that have not been considered in a previous iteration until none is left. In a separate filtering step, any of the distinct UMIs per gene that is only supported by one or two aligned reads is completely omitted from the counting. From the resulting count table, all counts originating from the 23 control wells were removed for the subsequent explorative analysis. All remaining wells correspond to single cells. Additional filtering reduced the sparseness found in this gene per cell matrix of UMI counts. Only cells with 1000 or more genes with at least one UMI count and genes with at least one UMI count in 10 or more cells were selected, leaving a matrix of 478 single cells and 10,238 genes. This matrix was scaled and normalized with the Bioconductor package scater (McCarthy et al., 2017). 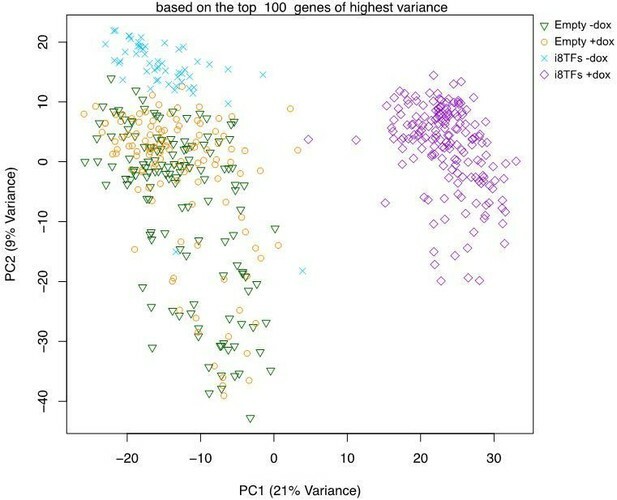 The principal components were calculated for the 400 genes that showed the highest variance after subtracting the mean-variance trend of all genes. The explorative analysis was performed using R (R Core Team , 2016). All software is freely or commercially available and is listed in the Methods description and product reference table. The accession number for all sc-RNA-seq and microarray data reported in this paper is GEO: GSE96986. The American Journal of Pathology 176:1983–1998. Methods in Molecular Medicine 105:273–288. American Journal of Sociology 92:1170–1182. The Journal of Mathematical Sociology 25:163–177. Journal of General Virology 82:1013–1025. Current Topics in Developmental Biology 118:1–20. Molecular and Cellular Biology 25:1215–1227. Molecular and Cellular Biology 29:4103–4115. The International Journal of Developmental Biology 54:991–1002. International Journal of Hematology 101:319–329. R Foundation for Statistical Computing. Methods in Molecular Medicine 105:257–272. The Journal of Experimental Medicine 212:93–106. Methods in Molecular Biology 538:317–334. The Annals of Statistics 35:2769–2794. The Annals of Statistics 42:2382–2412. Journal of Biological Chemistry 279:40906–40917. Thank you for submitting your article "Single cell transcriptomics reveals a new dynamical function of transcription factors during embryonic hematopoiesis" for consideration by eLife. Your article has been reviewed by three peer reviewers, one of whom, Amy J Wagers (Reviewer #1), is a member of our Board of Reviewing Editors, and the evaluation has been overseen by Aviv Regev as the Senior Editor. In this manuscript, Bergiers et al. leverage the power of single cell gene expression analysis to demonstrate co-expression of heptad transcription factors (Erg, Fli1, Tal1, Lyl1, Lmo2, Runx1 and Gata2) in a subset of embryonic YS and AGM cells that appear to represent pre-HSPCs. They further document distinct patterns of expression of these and other selected genes in other embryonic populations at these anatomical sites at distinct developmental stages, ultimately suggesting the existence of multiple distinct populations with different lineage potential. Finally, applying clever systems for inducible overexpression of one or multiple of these transcription factors in an in vitro ES differentiation system, they demonstrate unique features of the gene expression networks controlled by these TFs, including unexpectedly opposing actions in the specification of endothelial versus pre-HSPC fates that depend upon the specific subset of factors expressed (notably involving a dual role of Fli1, which in collaboration with Erg supports a cell endothelial fate and in collaboration with Runx1/Gata2 supports a hematopoietic fate). They also described the transcriptional changes occurring in endothelial cells and vascular smooth muscle (VSM) cells upon overexpression of the heptad TFs (+Cbfb). Together, these results allow the authors to propose a new molecular model for EHT, and possibly other key developmental transitions that may invoke dual competing TF function. The systems and data described also may be of use in ongoing efforts to optimize the generation of definitive HSCs from pluripotent cell sources. Overall, the work presents new mechanistic insights into the process of blood formation and identifies a previously unrecognized transient population of progenitors in between endothelium and HSPCs. The work is likely to be of interest to a range of investigators studying development and hematopoiesis; however, there are several aspects of the work and presentation that require revision/modification. 1) The manuscript is written in a rather long-winded and confusing manner, such that the main message (Fli1 dual role) is highly diluted. In addition, the figure panels are very small and the text is difficult to read. The authors should edit the manuscript to improve the figure quality/design and flow of the narrative, and to present a more concise and clear analysis of the data and conclusions. 2) The assumption that the authors identified a pre-HSPC population (in AGM and yolk sac (YS)) based on the expression of hematopoietic and endothelial markers should be better justified. The authors claim that they produced a homogeneous population of pre-HSPCs (+8iTFs + Dox). However, this population does not completely cluster with the pre-HSPCs (detected in vivo in AGM and YS). Does it mean that a certain type of pre-HSPCs is produced in vitro (pro-HSCs, pre-HSCs type I or type II)? The authors should provide a more informative (phenotypic/functional) characterization of this population to support their conclusion. 3) The rationale for the analysis of the VSM population produced in vitro is unclear. This part of the results cuts the flow of the paper and is very confusing. The enriched VSM population is contaminated by 20% of endothelial cells, rendering the data difficult to interpret. Moreover, the eVSM population is never compared to the VSM cells from the AGM/YS. As VSM cells never give rise to HSCs in the AGM or YS in vivo, the authors should explain why the eVSM population is used to identify the gene regulatory network and not the endothelial cells? 4) It is not clear whether Erg and Fli1 (or similarly Gata2 and Runx1) have a redundant, complementary or synergistic roles. It would thus be interesting to test them separately (8iTFs without each TF and not without the two TFs at the same time); however, unless the authors have already generated the requisite hES lines, this is likely to require extensive additional studies. If such data are available, they should be added to the paper; however, if these experiments cannot be completed and added to the paper in a timely manner, the authors should instead comment/speculate on their possible individual or redundant roles. 5) The authors present several sets of sc-qRT-PCR data and use correlative analyses to make comparisons. For example, in Figure 1—figure supplement 1C and D, cell clusters are defined independently by hierarchical clustering (HC) in AGM and YS. The clusters are then aligned by correlation coefficients (Figure 1B) or in a PCA projection (Figure 1C) and the authors state they are similar. How would the HC analysis look if the data was analysed together? Ideally, an integrated analysis of all sc-qRT-PCR data (Figures 1-4) together should be added to give a more objective impression of similarities / differences. 6) In Figure 1D the authors use a low-dimensional space defined by the PCA of AGM and YS cells and map additional data (from Gfi1-/- Gfi1b-/- cells) on top. They conclude from the location of these data in between Endo and pre-HSPC that the mutant cells were trapped in a transition state. In my experience, mapping data onto existing PCA spaces tends to map the data somewhere in the middle. How would this look if PCA was performed on all data? Which genes are responsible for the similarity and which ones fail to make the switch to pre-HSPC? 7) Why did the authors choose to include Cbfb with the heptad of TFs from Wilson et al. (Introduction section)? This seems kind of arbitrary and should be explicitly justified. Is this important for the results? 8) There seems to be a lot of fluctuation in the counts of the differentiation assays in Figure 4B, even in -dox (in which all cells should be the same). At the same time, the statistics on these data seem questionable. Why would the difference between 7=>16 (iFli1 VSM) be significant, but the difference 22=>0 (i8TFs EryPCs_II) not? Overall, the effects for the i8TFs seem striking enough compared to the rest to be convincing, but the more subtle differences between the single TF lines could be easily overlooked. The authors may need to increase the numbers on these data to make the conclusions more robust, and they also should check their statistics. 9) The authors use the PCA in Figure 4C to illustrate that i8TFs+dox make a very homogeneous population of pre-HSPCs. However, there seems to be a lot of variance not explained by the two shown dimensions. Why is that and does this bring into question the homogeneity of the population? Please provide additional text to explain/justify the conclusions drawn. 10) The focus on eVSM (subsection “Identification of gene regulatory network from single cell RNA sequencing data”) is confusing. Earlier they say that eVSM did not convert so well to pre-HSPC (Figure 4). Their microarray data shows more DEGs, but the induced cells from eVSM also had limited differentiation capacity (would that capacity be better if fully converted cells were FACS-purified first?). Is the limited efficiency in the induction in any way related to the fact that only a small percentage of the transcriptional variation is due to the difference between +dox and -dox (Figure 5C => PC2, variance explained = 1%)? Please add text to address/explain these points. 11) The GRN analyses are also rather confusing: Why were two networks used? The authors depict one (Figure 6D) but show descriptive metrics for another (Figure 6E, network not shown anywhere). This is a bit misleading. Why were additional genes used to infer the first, smaller network? Did it not work otherwise? How were the additional TFs chosen? What does the network really tell us? 26 of 145 target genes were found in the network. That's only 18%. Given that the network has over 7k genes in it, is this actually any more than expected by pure chance? 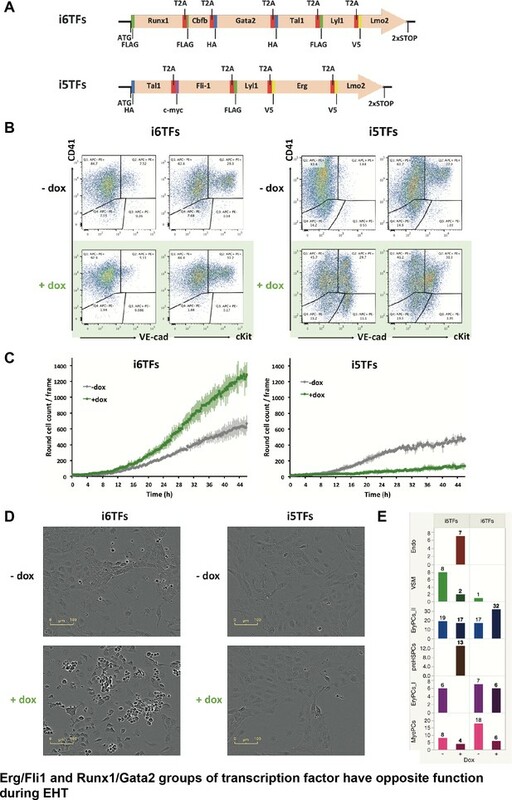 In the end, the authors derive from the whole GRN part of the analysis the conclusion that there are subsets of TFs tilting the cell fate either toward hematopoiesis or toward endothelial fate (which is good and interesting), but it seems that maybe this could have been achieved by just looking at the correlation matrix in Figure 7B? Please add further text addressing these points and explaining/justifying the analytical workflow and output. 12) The authors deliberately chose a design to minimize batch effects (subsection “Identification of gene regulatory network from single cell RNA sequencing data”) for the C1 scRNA-seq data (which is great). However, they should also address in the text whether batch effects might in any way have affected other conclusions in the paper. Many runs of the PCR assays were performed; the authors should explain how they were balanced. Thank you for resubmitting your work entitled "Single cell transcriptomics reveals a new dynamical function of transcription factors during embryonic hematopoiesis" for further consideration at eLife. Your revised article has been favorably evaluated by Aviv Regev (Senior editor), a Reviewing editor, and two reviewers. 1) The initial experiment (single cell qPCR) was based on a single litter replicate (one experiment, 4-6 embryos). This is partly mitigated by the follow ups, but needs to be stated clearly by discussing the shortcomings of the initial experiments. In addition, if any other data (including published data from other studies) can be highlighted as an external replicate it would be helpful as well, but is not strictly required. 2) Throughout the study, it is exceedingly difficult to follow the number of animals and independent experiments performed and thus to assess the strength of key conclusions. This is exacerbated because of the number of datasets and heterogeneity of technologies and experimental setups. We ask that the authors prepare an overview table listing clearly all the different samples used for the analyses in this paper. (We note that the meaning of "n=" is often quite obscure in the context of the paper). 3) The low numbers in the colony-forming assays is a particular concern. As it limits the reliability of the results presented in the respective part of the paper. To their credit, the authors are rather cautious about their claims about these assays. We appreciate that the comparison in the same assay enhances the validity, but ask that the authors note the samm number. The full reviews are provided for context below. Bergiers and colleagues made great efforts to respond to my comments and concerns, and to improve the fluidity and understanding of the manuscript. Figures are more readable and better organized (although the readability of the gene names beside the heatmaps could be improved). 1) A better identification of the pre-HSPC population generated by the authors was necessary. However, the fact that the population resembles to phenotypically defined pro-HSCs but to molecularly defined pre-HSCs type I reflect (to my opinion) the heterogeneity of the population generated. A functional analysis (e.g. transplantation, reaggregated in vitro culture) would have certainly better identified the pre-HSPC population. These experiments are time consuming but would have been of a great interest for the readers. 2) The part of the eVSM population was reduced and the indication that this population was used as a tool clarifies this part of the manuscript. 3) It would have been very interesting to test each TF separately (8iTFs without each TF and not without the two TFs at the same time). But discussing the potent redundancy or complementarity of these factors improved the discussion. Finally, I was extremely surprised that in the revised version (where the number of experiments performed was specified), it was mentioned that only one experiment was performed by tissue and time point, using very few embryos (4 to 6 embryos). Three independent experiments are usually performed to avoid the risk of biased data. In brief, the revised manuscript submitted by Bergiers and colleagues has been markedly improved. I appreciate the additional analyses added and I can sort of accept the rationale / justification for starting experiment with eVSM, for arbitrarily including Cfcb, etc. 1) Network analysis: The construction of the "small" network seems too arbitrary and the authors' rebuttal does little to convince me otherwise. Basically, the authors tried to build a network from the heptad of TFs (+Cfcb which they had arbitrarily added in before) and found it didn't give them any insights. So they looked at their favourite papers and added more nodes until they got an interesting result. How robust is this analysis? Can the same conclusions be reached by adding other TFs into the network? Do the conclusions hold if some nodes are removed? If those TFs are also considered of central importance to the processes studied, why were they not included in the previous experiments ("i12TFs")? To me, it would make a lot more sense and be much less biased, to build the "big" network (using a fast, but no-so-good correlation measure) first and to use this to inform which additional TFs to add to the small network (by using unbiased metrics calculated on the network, such as the. In their rebuttal, the authors state "the local network […] does not give a global picture of the network in the cell" – I agree, so what's the point of showing this at all? It's just to provide some nice-to-look-at (if you're into that kind of thing) network-y graphics that contains genes that ring interesting to people (because they were hand-picked from previous literature!). In a way, none of this would matter much if the network analysis was just a means to an end – i.e. to find the complementary TF networks biasing cells to different fates. However, the authors try to sell their network analysis approach as some sort of novel tool with wide applicability – which I just think it is not. 2) Colony-forming assays: The numbers here are weak and the authors pretty much admit that. I understand the experiments are difficult and time-consuming to perform and it wouldn't have been reasonable to ask for additional experiments. Still, I find these data as they stand somewhat unsatisfactory. Do the other reviewers find this convincing enough? We corrected the manuscript and changed the figures to improve the flow of the narrative and the visibility of the figure panels. We combined the key data from Figures 1 and 2 together to help focus our message (see new Figure 1 and Figure 1—figure supplement 1 to 6). 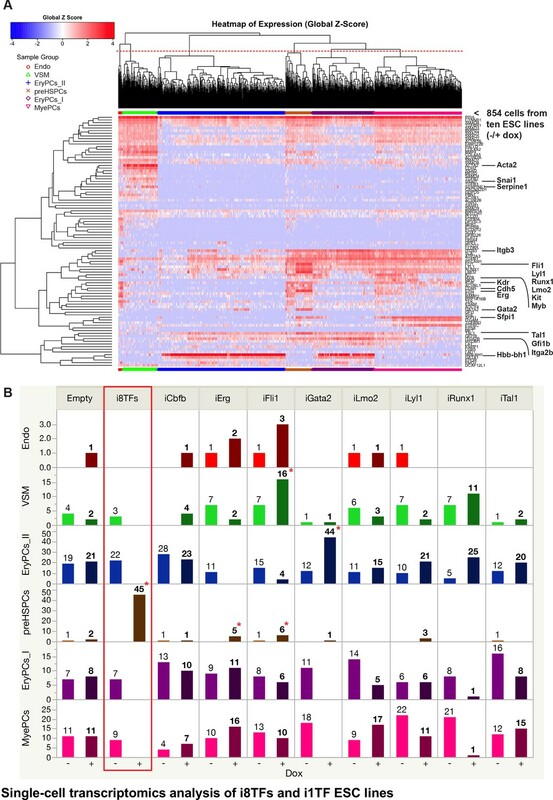 We have also edited significantly the corresponding sections of the text (see the new part “Key transcription factors identify a population intermediary between endothelial and blood cells during EHT in vivo and in vitro”). Another major change corresponds to the eVSM section of the manuscript (former Figure 5 and former Figure 5—figure supplement 1, now in Figure 3—figure supplement 2, 3 and 4). We have trimmed significantly this part of the text to improve the flow in genera (see the part “Simultaneous overexpression of Erg, Fli1, Tal1, Lyl1, Lmo2, Runx1, Cbfb and Gata2 during hemangioblast differentiation leads to the formation of a population resembling Pre-HSPCs”). This is a very interesting question. To answer it, we have added experiments that are now presented in a part called “in vitro generated Pre-HSPCs share similarities with AGM Pre-HSCs type I”. See also the new Figure 5 and Figure 5—figure supplement 1 and 2. We characterized the population produced in vitro with the eight TFs and compared it to in vivo cells identified by the group of Alexander Medvinsky (Rybtsov et al., 2014). As shown in Figure 5A, the i8TFs+dox cells are VE-cad+CD45-CD41+CD43- similarly to the in vivo Pro-HSCs. However, a closer transcriptional characterization showed that transcriptionally the i8TFs+dox cells look like Pre-HSCs type I. This is in line with the functional data showing that i8TFs+dox cells are able to generate colonies in CFU-assay (Figure 4) like the Pre-HSCs type I while the Pro-HSCs have little CFU-C activity (see Figure 4 of Rybtsov et al., 2014). We agree with the reviewers; the flow of our manuscript was slowed down because of the part on the eVSM population. We have drastically reduced this section as we explained in our response to the point 1. As the reviewers pointed out correctly, the VSM cells do not generate HSC in vivo. That is why we did not isolate them from AGM and Yolk Sac. On the other hand, we did consider them in our in vitro model because the data obtained suggested that these cells were also changing dramatically. Indeed, at the moment of the dox treatment, they were very numerous in the BL-CFC culture (new Figure 3—figure supplement 2A) while after 48-hours treatment most of the culture is VE-Cad+ CD41+ suggesting that all the cells, including VSM cells, reacted to the treatment (new Figure 3A). We showed that it was indeed the case (new Figure 3—figure supplement 2C). We found that very interesting and thought that it emphasized the crucial function of the eight TFs. Since our main goal was to use single-cell RNA sequencing to study the impact of the simultaneous expression of the eight TFs on the transcriptome, we found that VSM cells were very useful as a tool. Indeed, they express almost none of these TFs while the Endo cells express already Erg, Fli1, Lmo2 and Tal1. To understand how the 8TF induction by dox treatment affected GRNs, we needed to avoid as much as possible cells, which were already undergoing the EHT like the Endo population (see new Figure 3—figure supplement 2C). If we had used the Endo population for this analysis, we would have only a two-fold increase in VE-Cad+ CD41+ population between -dox and +dox conditions (43% versus 98%). On the other hand, the eVSM in no dox condition only gave rise to 9% of VE-Cad+ CD41+ in comparison to 88% in +dox condition. From this point of view, the eVSM was the most optimal solution because of this difference and also because of the gene expression difference detected by microarrays (new Figure 3—figure supplement 3B and new Supplementary File 5). Indeed, upregulated genes in eVSM+dox compared to eVSM-dox belonged to the “Immune system process” and “Vascular development” GO terms (new Figure 3—figure supplement 4A). This suggest the induction in these cells of a dual Endothelial/Hematopoietic identity compatible with the Pre-HSPCs population. Overall, these characteristics facilitated the development of the bioinformatics pipeline necessary to resolve the GRNs. It turned out to be the right approach as we identified Gpr56 as a key target of these TFs and the tools/approaches that we have developed with the eVSMs could be readily used with the Pereira dataset putting us on the track of the Runx1/Fli1 antagonistic function. We have added text to explain better the reasons we used the eVSMs (see the first paragraph of the section called “Identification of gene regulatory network from single cell RNA sequencing data”). This is a very interesting comment. Unfortunately, these four additional ESC lines have not been generated and it would have taken more than two months to do the required experiments. Based on sequence homology, we can hypothesize that some redundancy could exist between Erg and Fli1 that are both ETS transcription factors. Wilson and colleagues have also shown that in HPC7 more than 90% of the loci targeted by Fli1 are also targeted by Erg (Wilson et al., 2010). However, these loci represent only about 60% of the ones targeted by Erg, which might suggest a broader role for Erg. The possible redundancy between Erg and Fli1 is also supported by our single TF inducible cell line data. Flow cytometry and single-cell qRT-PCR analyses have shown that both TFs have similar effect on the differentiation (Figure 3—figure supplement 5D and Figure 4). 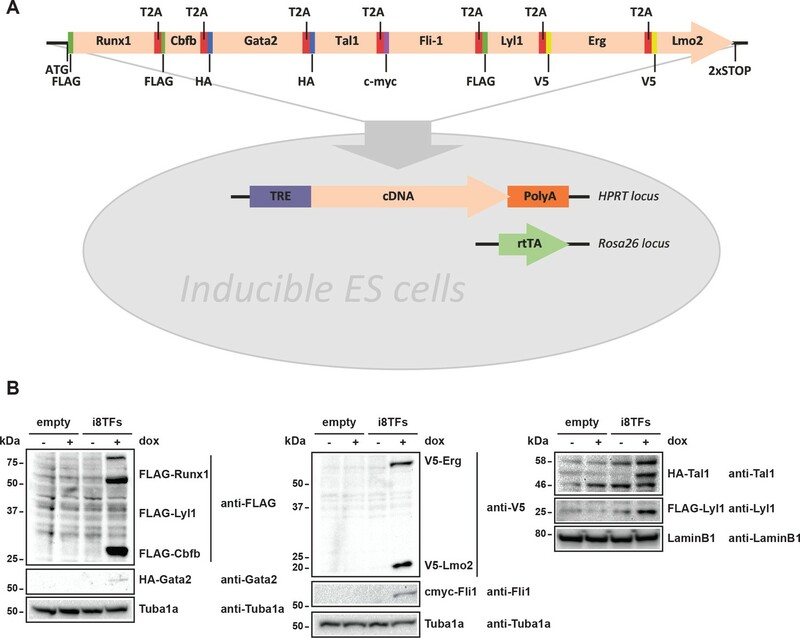 Regarding Runx1 and Gata2, our single TF inducible cell line data support their functional similarities (Figure 3—figure supplement 5D and Figure 4). Additionally, the network analysis suggests that Runx1 and Gata2 could cooperate together (Figure 7A). Indeed, they have both similar directional correlations with common targets. Finally, Wilson et al., showed also that Gata2 and Runx1 interact physically in vitro and showed that Runx1+/−::Gata2+/− compound heterozygous embryos are not viable due to severe hematopoietic defects supporting the notion that the two proteins are involved in the same biological process. Since Gata2 and Runx1 are belonging to two different classes of transcription factors, it is more likely that they have complementary or synergistic role than being redundant. Additional text has been added to the discussion in the section discussing our model (see new Figure 9). As suggested, we analyzed all the sc-qRT-PCR together. We first combined the populations of AGM and YS to do a hierarchical clustering analysis (see Figure 1—figure supplement 4B). For both tissues, the groups shown in Figure 1 generally clustered according to their identity although some cells from the intermediary populations (AGM_SC_2 and YS_SC_2) clustered with the Endothelial groups (AGM_SC_1 and YS_SC_1), possibly because of a higher endothelial gene expression. 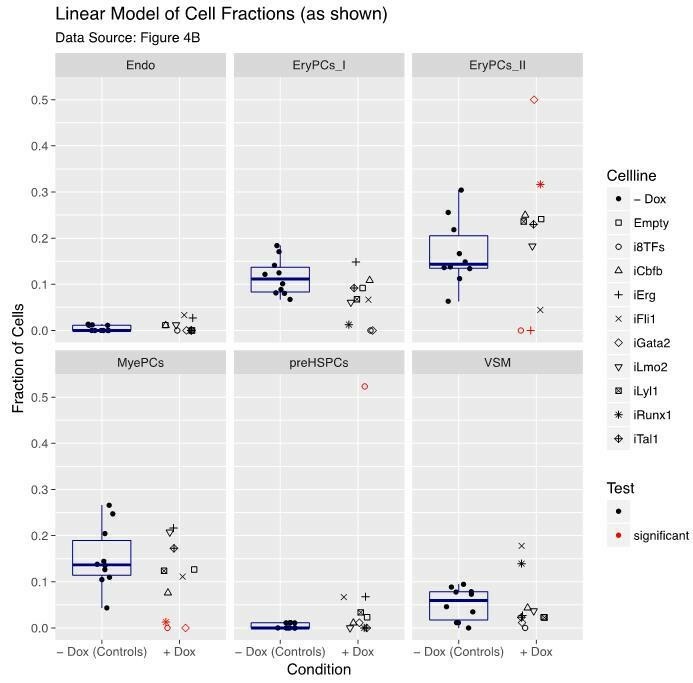 Moreover, we combined the single-cell qRT-PCR results of a total of 1,660 cells (Figures 1, 4 and 5) and compared them to each other using PCA (see Figure 5—figure supplement 2). As shown in this PCA analysis, the combined analysis of all the sc-qRT-PCR data confirmed what had been stated in the first figures of this manuscript. The expression of the selected 95 genes is sufficient to follow the endothelial to hematopoietic transition. Cells from in vivo AGM and yolk sac, together with in vitro cells from the inducible lines, are spread along the transition without major clustering due to the origin of the cells (in vivo, in vitro, embryonic regions, etc). The clusters identified based on the individual analyses presented in the Figure 1, 4 and 5 can be located on the PCA and fit with our previous observations. Vascular smooth muscle cells from in vitro analyses are clustering apart. Endothelial clusters from AGM, YS and in vitro samples are all in the same part of the PCA plot, connected to hematopoietic progenitors through the Pre-HSPCs from in vivo and in vitro samples and Pre-HSCs from in vivo. As expected, Pro-HSCs are located closer to the endothelial population while the Pre-HSCs type I are closer to the hematopoietic progenitors. We substituted the PCA projection analyses of former Figure 1D by an integrated analysis to have a more objective impression of similarities and differences. As shown in new Figure 1B, the conclusions drawn are similar to the ones based on the PCA projection analysis. The only difference is that the Gfi1-/-Gfi1b-/- cells are clustered more with the Pre-HSPC group. In general, there is no major gene expression difference between these groups apart for the absence of Gfi1 and Gfi1b expression. However, Gfi1-/- Gfi1b-/- cells express more the endothelial genes Pcdh12 and Sox7 and less the hematopoietic genes Ptprc, Sla, Mpo, Itgam, Myb and Spi1 (see new Figure 1E). Cbfb is the β subunit of the heterodimeric complex in which Runx1 is the α subunit. The function of Cbfb is to enhance Runx1 binding to the DNA. Moreover, Cbfb has been shown to be essential for Runx1 function in vivo (Wang et al., 1996; Tahirov et al., 2001). Based on these elements, we considered both proteins to be a single functional unit and that is why Cbfb was included in our polycistronic transgenic construct. That way we were able to keep the ratio between the two partners while overexpressing the transcription factors upon doxycycline treatment making sure that Runx1 could work properly. The reviewers are right, increasing the number of cells would help to control the fluctuations in the differentiation assay and offer more power to detect changes. Unfortunately, due to lack of time, we could not do it. However, we have improved our statistical analysis, added a new visualization and provided additional plots aiming to support our conclusions. Our analysis is based on the cell counts as shown in Figure 4B but also accounts for the total number of successfully classified cells per cell line (sum of all cells per cell line in Figure 4B). To better depict this aspect, we generated an additional visualization that displays all calibrated data (“fractions of cells”), rearranged by pooling all “-dox” controls to emphasize the contrasts of interest. We also added a boxplot (Author response image 1) indicating the variation within the “-dox” control groups. Each individual “+dox” data point is compared to its respective “-dox” control group (Figure 4—figure supplement 1). In contrast to the model used in the manuscript, if our results were analysed by a standard linear model (with Gaussian distribution) followed by multiple testing correction, then indeed the 22=>0 (i8TFs EryPCs_II) change would be significant while the 7=>16 (iFli1 VSM) would not remain significant as indicated in Author response image 1. This is in line with the reviewers´ comments. However, this model assumes that the data are continuous and this is not valid for data based on discrete counts like ours. So, we decided to choose a generalized linear model, initially with Poisson distribution (original submission) and now with quasi-Poisson distribution. Indeed, the model with quasi-Poisson distribution appears to be more stringent with our data (Author response image 2). Results are indicated in Author response image 2 and were added in Figure 4—figure supplement 1. There are five significant contrasts compared to seven as reported in the previous version of our manuscript (Figure 4). Still, these results should be taken with precaution since the high number of singletons challenges the model-fitting algorithm. Besides that, the statistical model does not fully address the multivariate nature of the data. Nonetheless, in line with the additional visualization, we consider our revised results relevant for the current manuscript and the prioritization of the follow up work described in the new Figure 8 (old Figure 7). We agree with the reviewers’ observation that the variance explained by the first two principal components as shown in Figure 4C (now Figure 4—figure supplement 2B) is comparably low. However, if the PCA is calculated for the top 100 genes of highest variance instead of the top 400 as in Figure 4—figure supplement 2B then the explained variance increases to 30% (PC1+PC2, see Author response image 3). Finally, we agree with the reviewers, the FACS-purification of the eVSM+dox cells, in particular of the cKit+ ones, may potentially lead to a better output in the CFU-C assay. 11) The GRN analyses are also rather confusing: Why were two networks used? The authors depict one (Figure 6D) but show descriptive metrics for another (Figure 6E, network not shown anywhere). This is a bit misleading. Why were additional genes used to infer the first, smaller network? Did it not work otherwise? In Figure 6D (now Figure 6A), the first network (based on dCor) is only the local network of the 12 seed genes, it does not give a global picture of the network in the cell – i.e. only correlations between those 12 genes and all others were considered (~240,000 total correlations). The seed genes would by construction be the most important in the local network. However, because dCor is very slow it is computationally infeasible to calculate the global network with it. In contrast, the second network in Figure 6E (now Figure 6B) is the global network – i.e. the correlation between all possible pairs of genes was calculated – so it makes sense to look at how important the seed genes are in the whole network. However, to calculate the correlation for all 142 million possible pairs, we had to use a very fast correlation method thus we used Spearman correlation. How were the additional TFs chosen? With only the eight TFs as seeds, the small network for the sc-RNA-Seq data on the i8TFs cells was much smaller and did not contain either Runx1 and Fli1 (Author response image 4 left panel). Since these factors are well established as important in EHT and hematopoiesis, we hypothesized that these factors may participate in more complex relationships through other TFs we had not initially considered. Thus, we considered several prominent papers (Beck et al., 2013; Moignard et al., 2015; Tanaka et al., 2012; Bonzanni et al., 2013; Moignard et al., 2013) examining these processes and added additional TFs which were included in the network in at least two papers by different authors. For consistency, all 13 TFs were used in the Pereira data as well, however the inverse relationship between Fli1 and Runx1 apparent in this network does not depend on the inclusion of the additional TFs (see Author response image 4 right panel). The text has been updated to clarify this point. (Left) 8TFs network in our sc-RNA-Seq data. (Right) 8TFs network in Pereira sc-RNA-Seq data. What does the network really tell us? 26 of 145 target genes were found in the network. That's only 18%. Given that the network has over 7k genes in it, is this actually any more than expected by pure chance? No, this was not more than expected by chance, p= 0.3 using a hypergeometric test. This has been noted in the text. In the end, the authors derive from the whole GRN part of the analysis the conclusion that there are subsets of TFs tilting the cell fate either toward hematopoiesis or toward endothelial fate (which is good and interesting), but it seems that maybe this could have been achieved by just looking at the correlation matrix in Figure 7B? Please add further text addressing these points and explaining/justifying the analytical workflow and output. We focused on the subsets of TFs tilting cell fates towards hematopoiesis/endothelial fate as this was the most prominent and robust finding of our work. However, identifying this relationship within a large gene-gene correlation matrix is not trivial due to the large number of other correlations present and its relatively hard to interpret “hairball” structure (see Author response image 5), which is also the reason why a visualization of the full gene-gene correlation network was not included in the original manuscript. Thus, we performed targeted analysis of the key TFs and their interactions, which also revealed other interesting potential relationships – such as the role of Gata2 and Lmo2 in regulating different subsets of the genes involved in the Fli1-Runx1 antagonism (Figure 7A), or the core network of Lmo2-Erg-Lyl1 (Figure 6A). To control for technical variation in our sc-qRT-PCR, we used a commercial cDNA mix allowing us to detect consistently most of our genes of interest (93 genes out of 95). In the bar graph in Author response image 6 we have plotted the average Ct Values of the 93 genes from 19 independent PCR runs with the Fluidigm Biomark HD. The standard deviation is indicated as an error bar in the graph. As shown in this plot, we had very little variation in performance across the different runs (average standard deviation 0.3). This is consistent with the results of our analysis where we showed that the data from Figures 1, 4 and 5 could be combined in a PCA plot and cells with similar characteristics were clustering with each other even when they were coming from different experiments (Figure 5 —figure supplement 2). We have now mentioned in the text how we controlled for technical noise in our sc-qRT-PCR (see the “Single-cell quantitative RT-PCR” section in the Material and Methods). We understand the reviewers’ concerns. After checking carefully our notes, we found out that the number of embryos stated previously (4-6) was not correct. We apologize for our error. The right numbers are listed below. We also added in the Materials and methods section the procedure that we used to isolate AGM and yolk sacs. The Figure 1A is the result of three runs of single-cell q-RT-PCR performed independently (each run corresponded to one time point). For each time point, AGM and Yolk sac cells always came from the same litter of mouse embryos. The single-cell FACS sorting of AGM and Yolk Sac cells was always done on the same day for each time point (E9, E10.5 and E11). Even though most of our results were based on single litter replicate, we are confident that our conclusions are correct because similar populations were found at different time points (hence derived from different litters) and were shared between AGM and Yolk sac. Indeed, hierarchical clustering analysis showed that the Endo and Pre-HSPC groups are composed of cells coming from all time points (four different litters) and all tissues while HSPCs were found at E10.5 and E11 (three different litters) and from both AGM and Yolk sac. Moreover, the group of Niels-Bjarne Woods has recently identified populations similar to ours using single-cell q-RT-PCR and the human in vitro Endothelial-Hematopoietic transition (EHT) model. This model is based on the differentiation of human ES cells (Guibentif C et al., 2017). In particular, they found that the intermediate population between endothelial and blood cells during EHT (called Pre-HSPC in our study and EHT cluster in the Guibentif publication) co-expresses at the single-cell level Runx1, Lyl1, Tal1, Gata2, Erg and Fli1 (Lmo2 was not assessed) similarly to the Pre-HSPC population that we described (see Figure 1D of Guibentif C et al.). Although Guibentif C et al. did not study further the functional meaning of the co-expression of these transcription factors; their results reinforce our conclusions and suggest the evolutionary conservation of the EHT process (see Discussion, second paragraph). As requested, we have now added an overview table listing clearly the different samples used for the analyses in our paper. Please see supplementary file 11. We agree with the reviewers, the frequency of cells (i.d. CFU/number of cells plated x100) giving rise to blood colonies is low. The maximum frequency we have got is around 2% (Figure 3E, CFU-Mac+dox). Nonetheless, our results are in line with the performance of this type of assay in previous publications. Going through a series of papers using the same protocol of CFU-assay and cells derived from differentiated mouse ESC, we found that the frequency of cells giving rise to blood colonies ranged from 0.033% and 8% (see table below). In that context, the frequencies that we have obtained are within the range of related published works using similar cells and protocol. In addition, we would like to stress that the frequencies we obtained were consistent across several independent experiments and we showed reliably that the overexpression of the 8 TFs increased the frequency of CFU in a given population (Figure 3E and Figure 3—figure supplement 2D). To facilitate the comparison of the CFU-assay results between Figure 3E and Figure 3—figure supplement 2D, we are now showing the same number of plated cells in both graphs (i.d. 35 000 cells, see new Figure 3—figure supplement 2D). We thank Georges Lacaud (University of Manchester) for the Runx1+/hCD4 ESC line; Michael Kyba (University of Minnesota) for the A2.lox.Cre ESC line; Tariq Möröy (Université de Montréal) for the Gfi1:GFP and Gfi1b:GFP mouse lines; Philip Hublitz (University of Oxford) for the design of the 8TF construct; Daniel Bilbao, Kalina Stantcheva and Cora Chadick (EMBL Rome FACS Facility) for cell sorting; Jelena Pistolic (EMBL Genomics Core Facility) for microarrays; Leo Chan and Mai Ho (WaferGen) for sc-RNA-seq; Gang Sun (Fluidigm) for advice on the SINGuLAR Analysis toolset; and Imre Berger (University of Bristol) and Philip Avner (EMBL Rome) for fruitful scientific discussions. The European Molecular Biology Laboratory, the EU Marie Curie Actions Cofund and the Wellcome Trust supported this work. Animal experimentation: All experiments were performed in accordance with the guidelines and regulations defined by the European and Italian legislations (Directive 2010/63/EU and DLGS 26/2014, respectively). All mice were bred and maintained at EMBL Rome Mouse Facility in accordance with European and Italian legislations (EU Directive 634/2010 and DLGS 26/2014, respectively). © 2018, Bergiers et al.